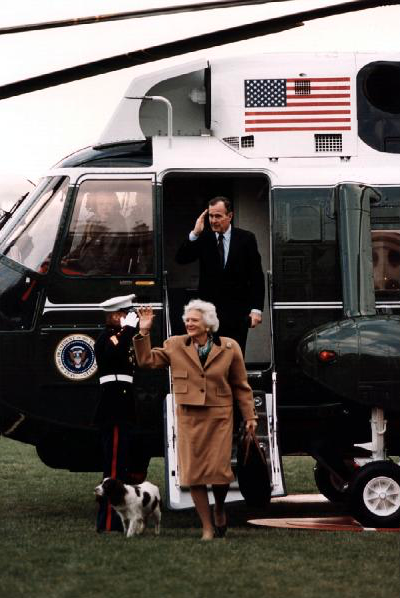 A detailed look at the presidential limousine. 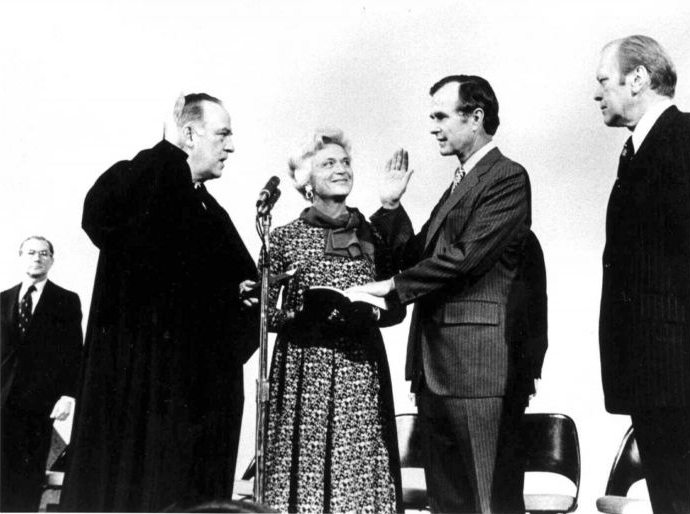 There are many icons synonymous with the President of the United States. 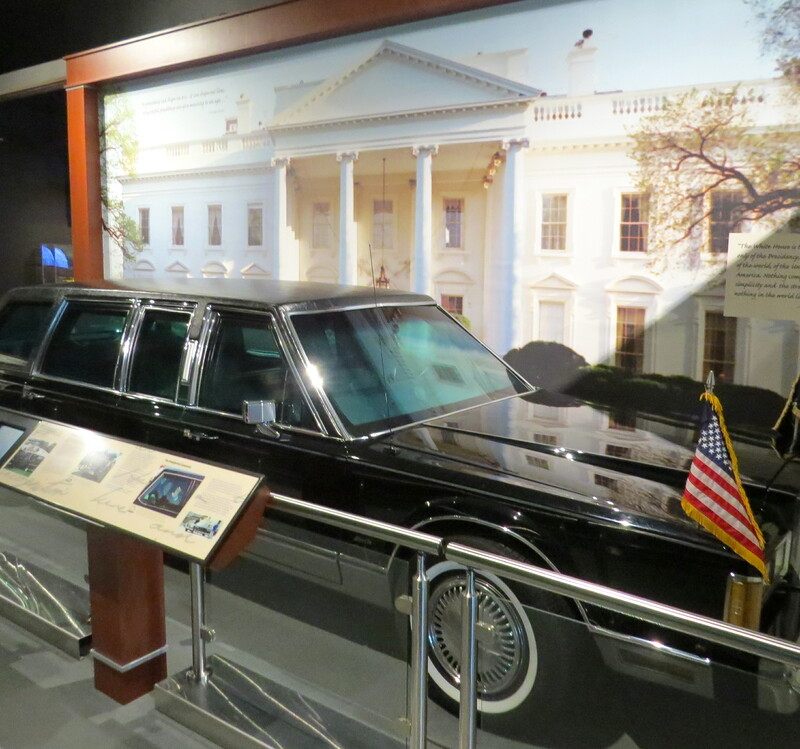 Here you will get the chance to have a detailed look at a presidential limousine, a three foot crystal Presidential Seal and other symbols of the Presidency. 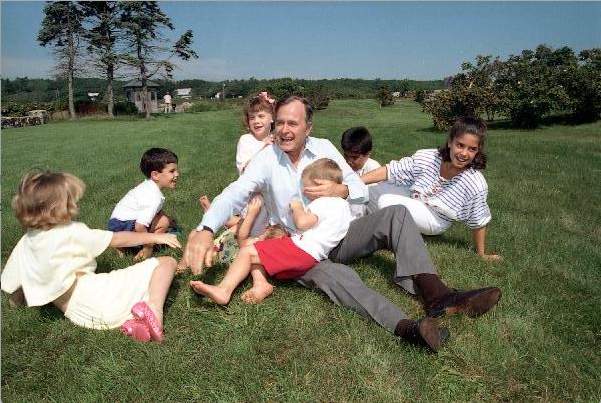 Wander through the Bush Family scrapbook, viewing the family through pictures, videos and more. 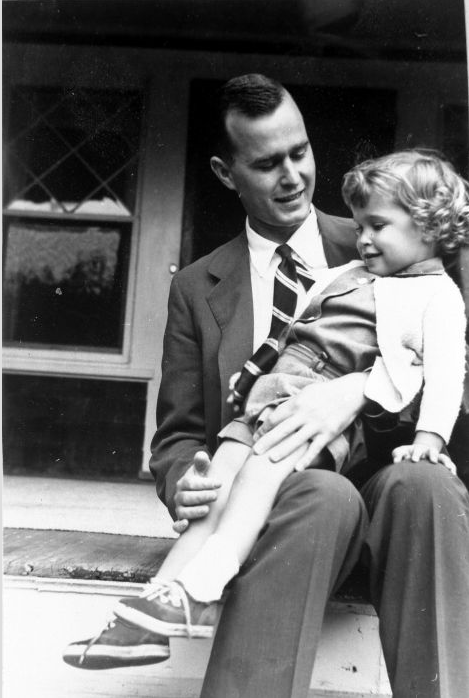 George Bush holds his daughter, Robin, 1953. 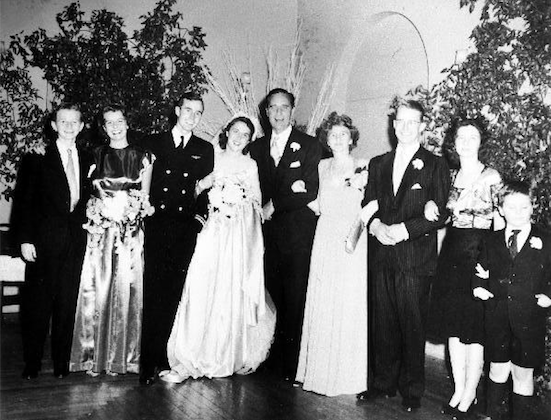 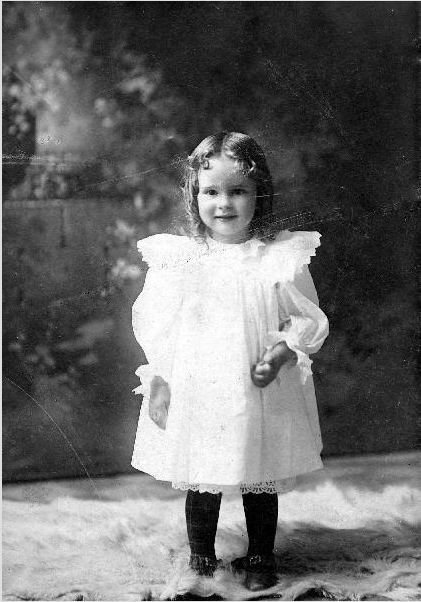 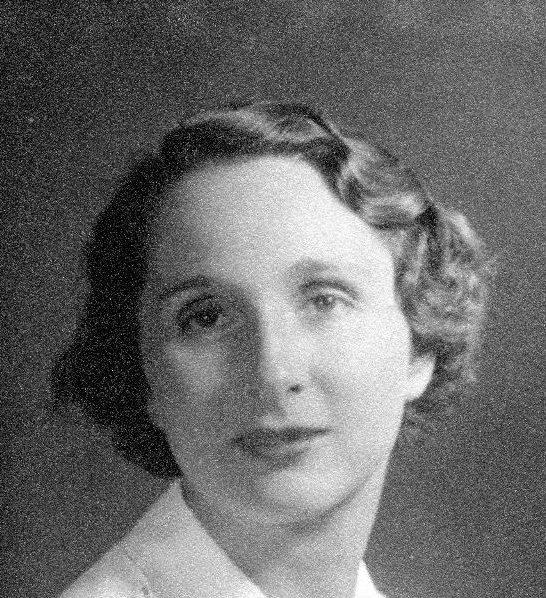 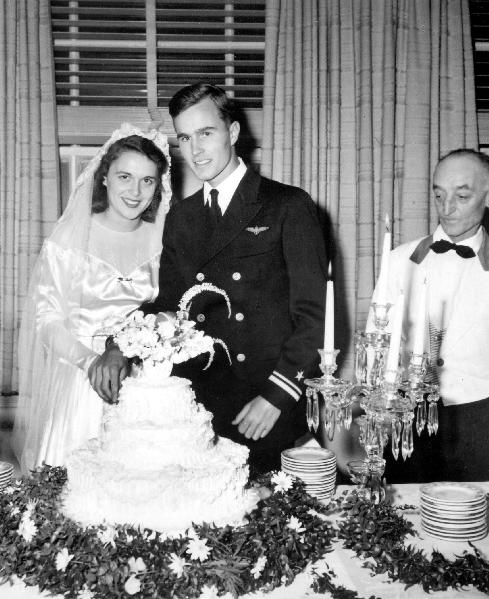 Take a glimpse at the childhood and family history of the woman who would one day be the mother of a President and the First Lady of the United States of America, Barbara Pierce Bush. 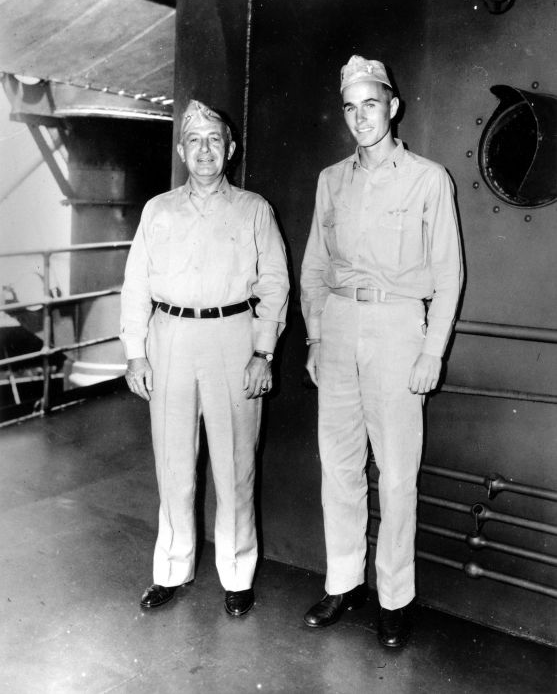 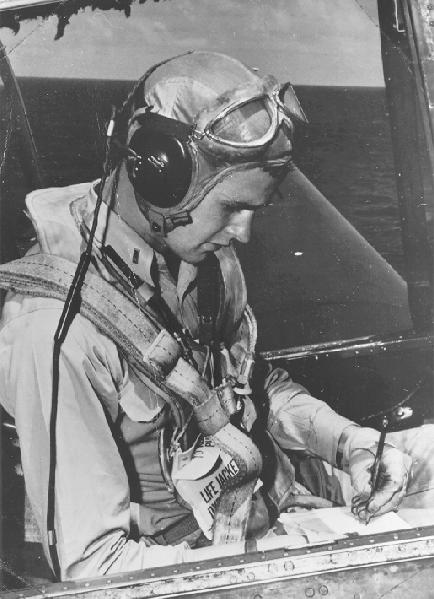 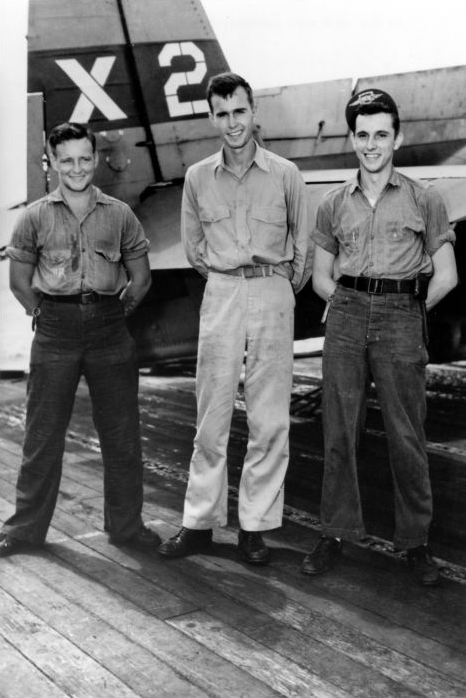 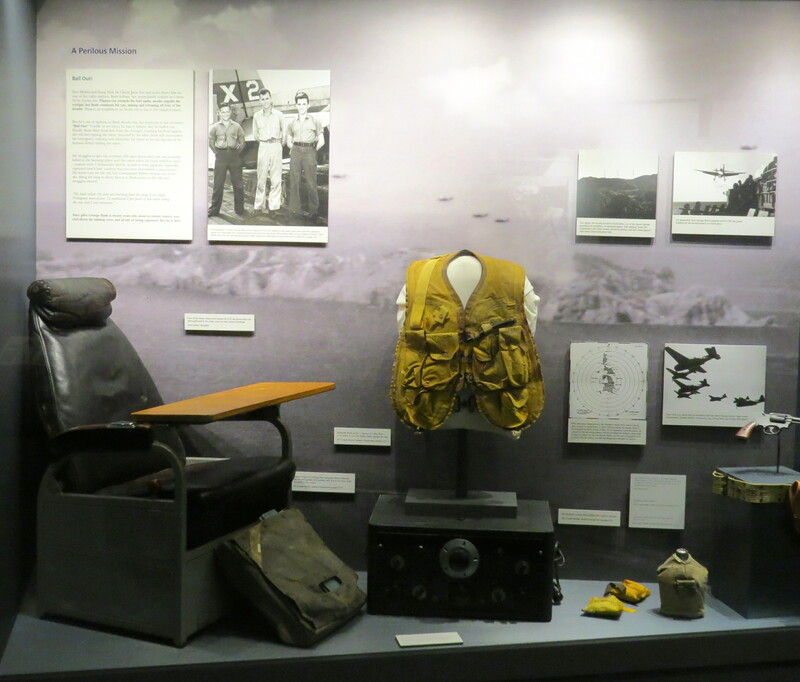 This area of the museum is dedicated to the history of World War II, and the impact the attack on Pearl Harbor had on a young George Bush. 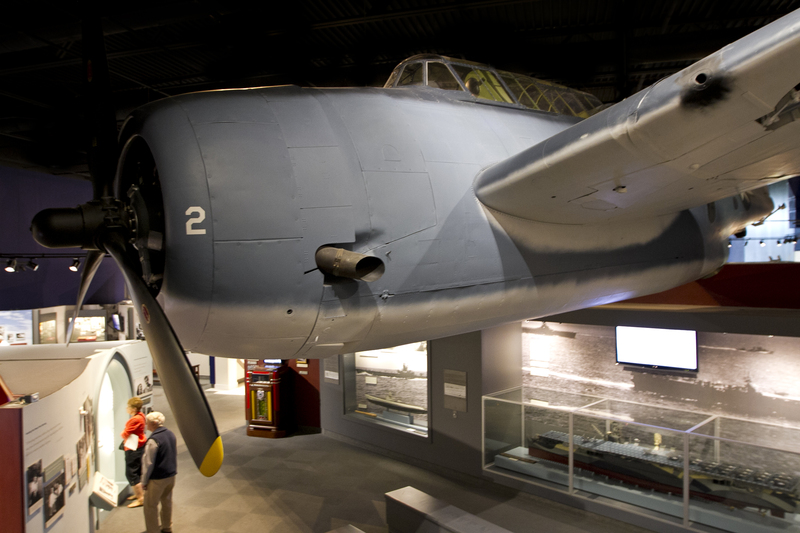 A highlight of this area is the restored 1944 TBM Avenger, just like the aircraft Bush flew as a Navy pilot. 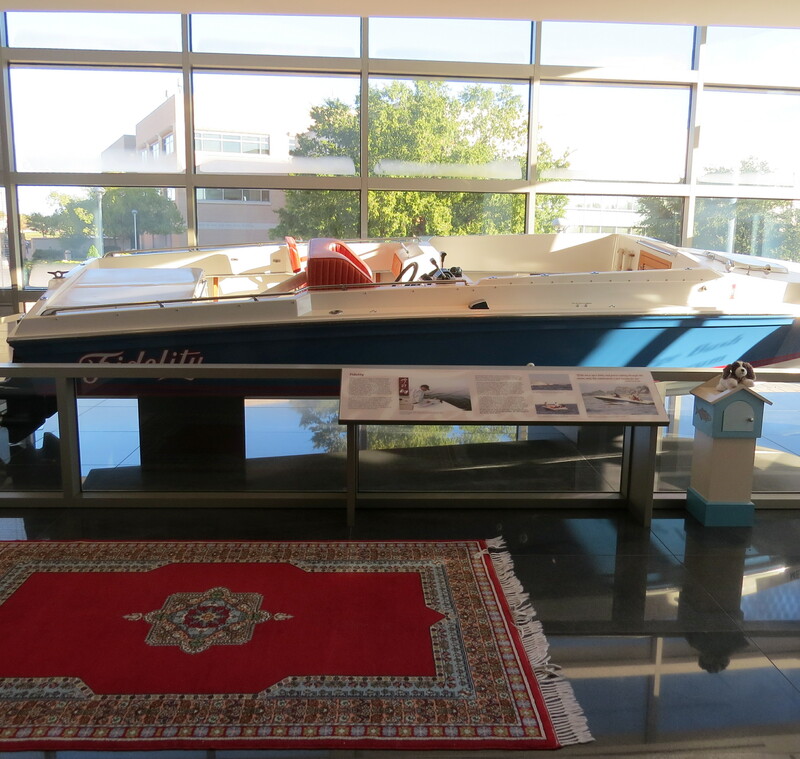 Don't miss the flight simulator where you can try your hand at landing the TBM on the deck of the San Jacinto. 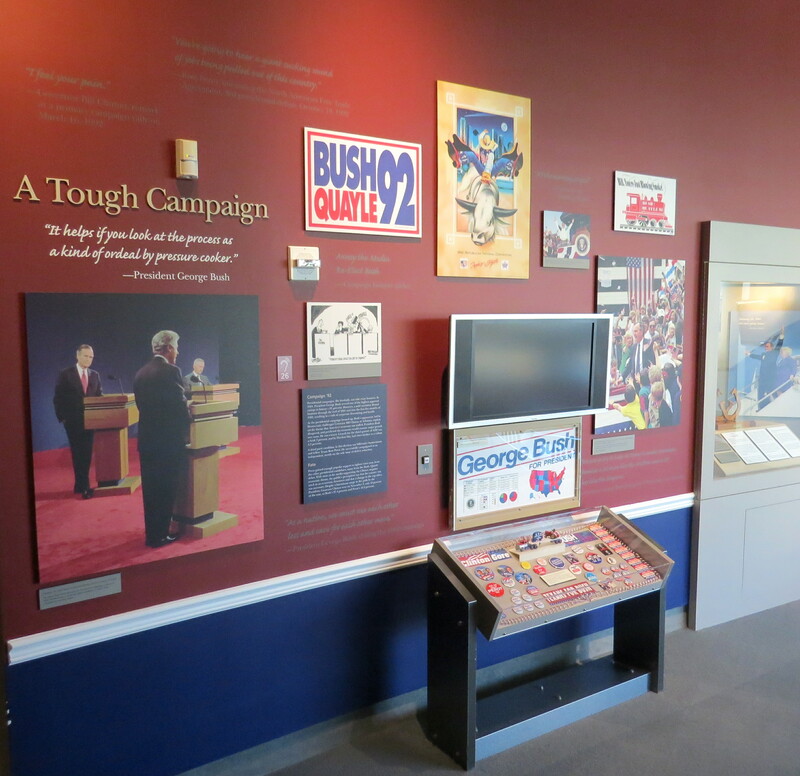 A model of an aircraft carrier and many of George Bush's personal mementos complete this portion of the museum. 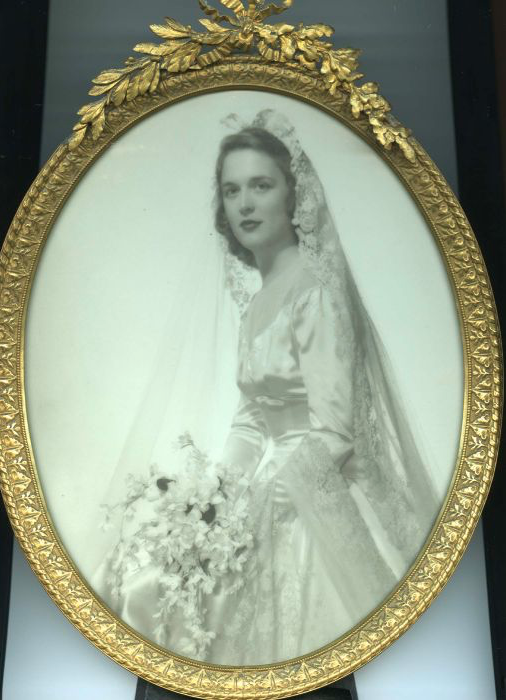 Steal a look into the newly married life of George and Barbara in this lovely exhibit that features a stunning replica of Barbara's wedding gown. 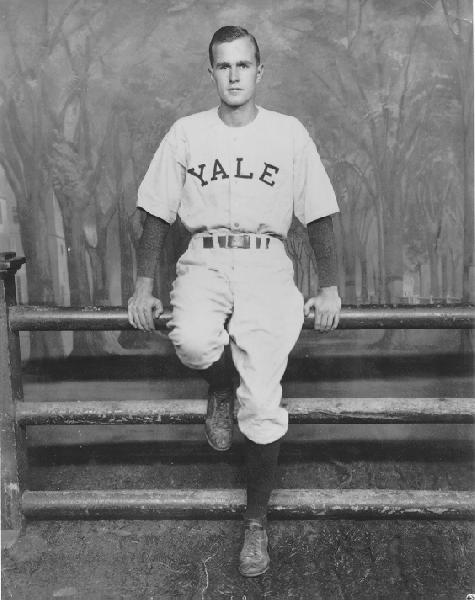 Their young life at Yale and their growing family are documented with original photographs and letters. 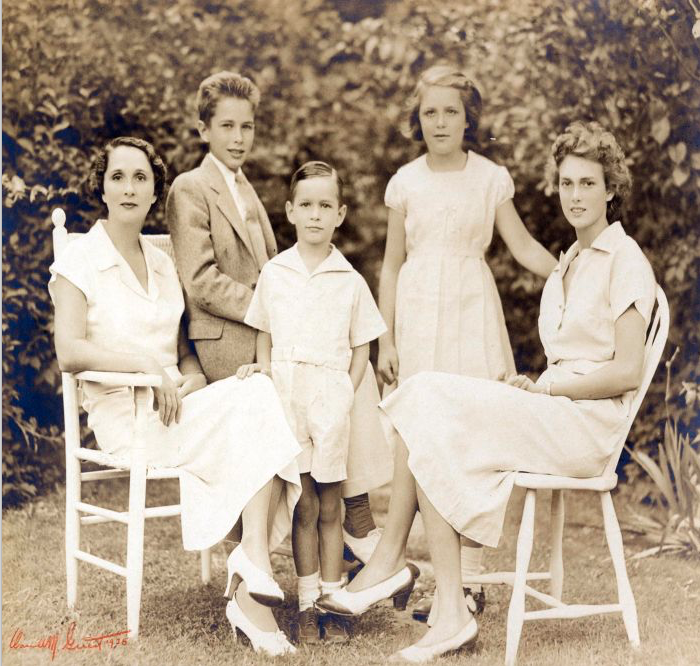 A restored 1947 Studebaker (identical to the one Bush drove to Texas in 1948) welcomes you into the life of the family as they begin a new journey in West Texas. 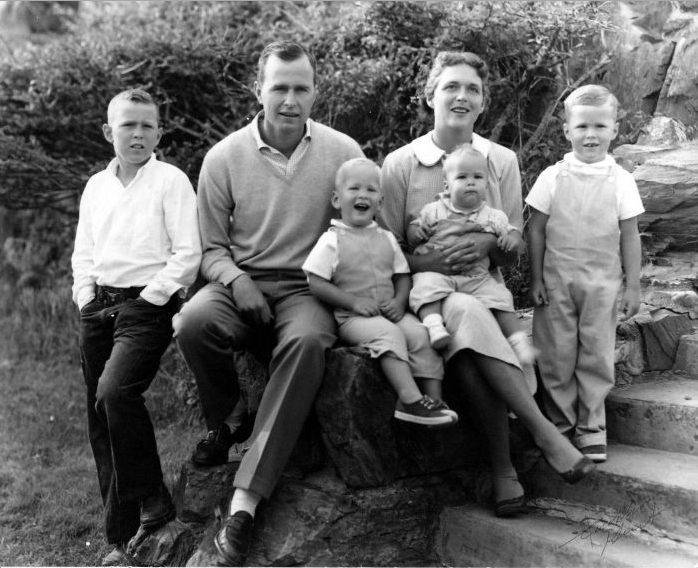 It is here that George W. is joined by siblings Pauline Robinson (Robin), John (Jeb), Neil, Marvin, and Dorothy (Doro) Bush. 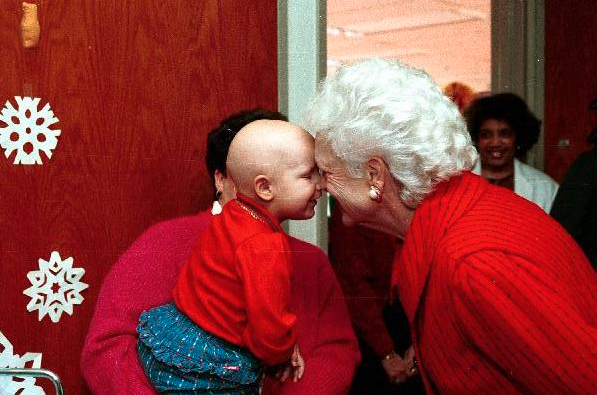 Included in this area is the tragic story of Robin's fatal battle with Leukemia. 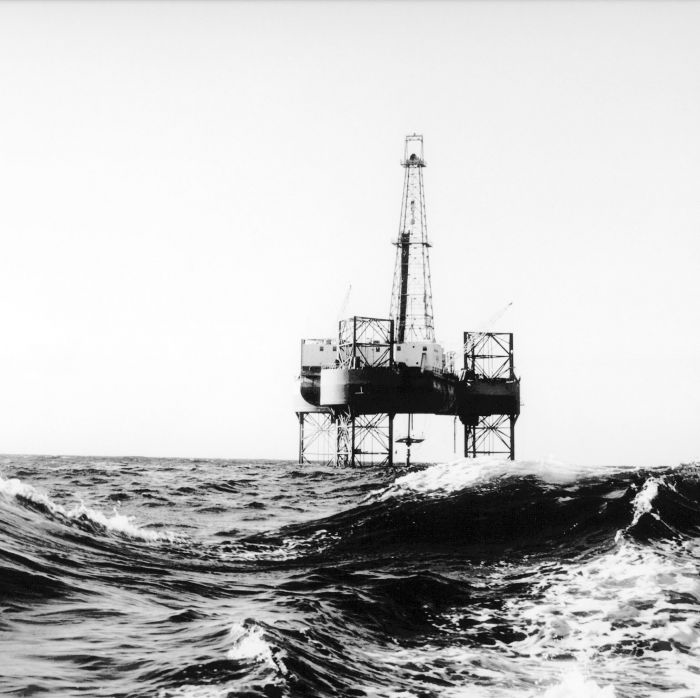 View from the water of a Zapata oil drilling platform. 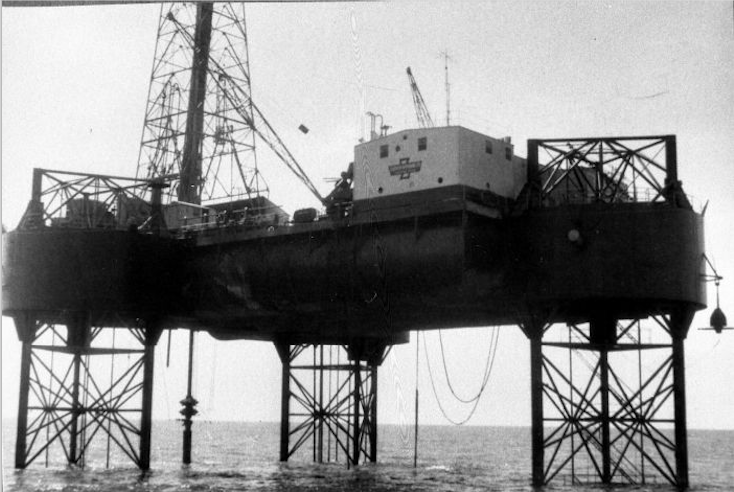 George's success in the oil business and the creation of the Zapata Offshore Company, which ushered in a new era in the oil drilling industry, is detailed here. 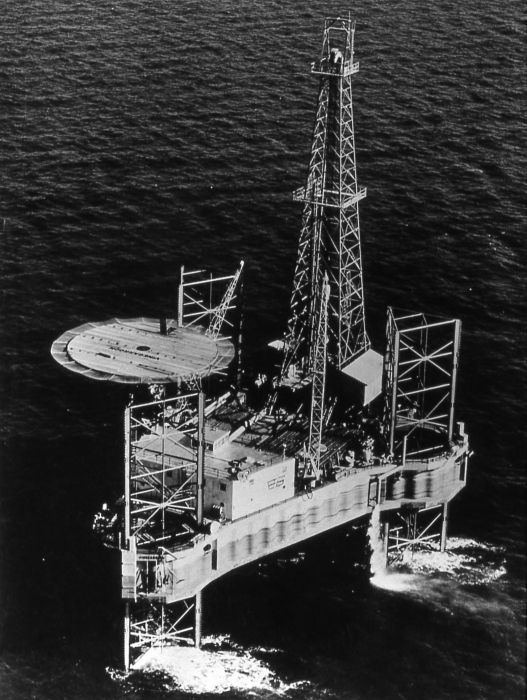 Vintage video included in this area shows the launching of revolutionary new drilling technology used by Zapata. 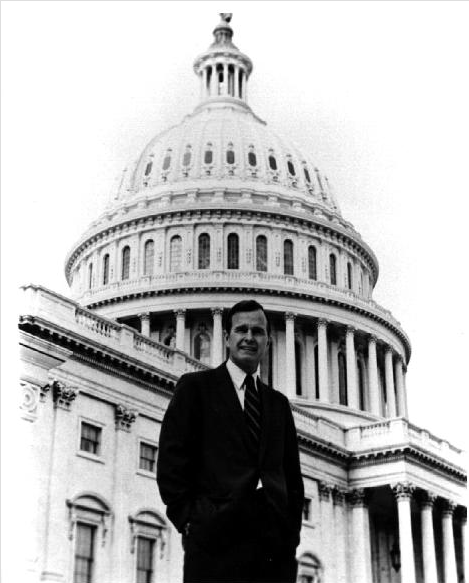 Beneath the towering presence of this 30-foot tall replica of our nation's Capitol dome, follow in George's footsteps as he begins his new career as a United States Congressman. 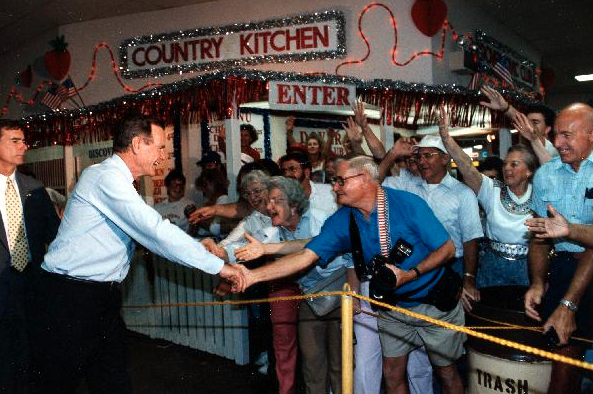 There are also many pictures, articles and political advertisements from George's first successful campaign. 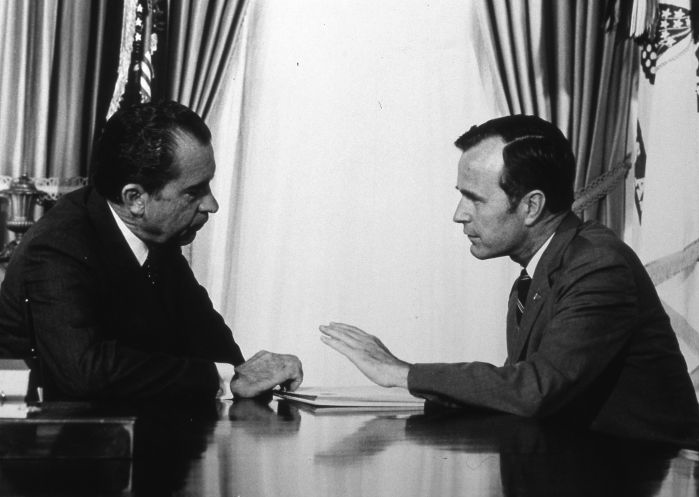 George Bush, US Ambassador to the United Nations, meets with President Nixon in the Oval Office, date unknown. 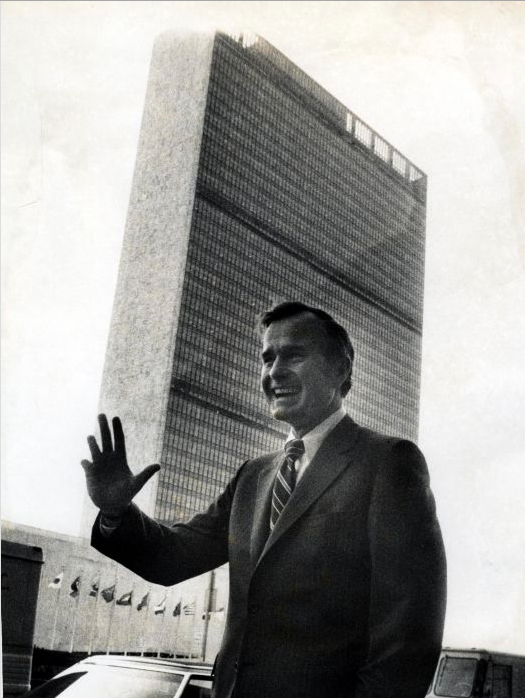 After serving as a Congressman, President Nixon selected George Bush to be the Ambassador to the United Nations. 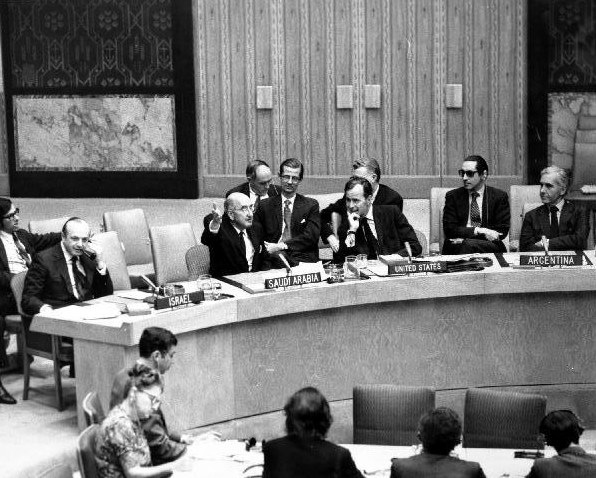 The amazing murals and recreation of a portion of the U.N. create the feeling that you are at U.N. Headquarters during the turbulent years of the early 1970s. 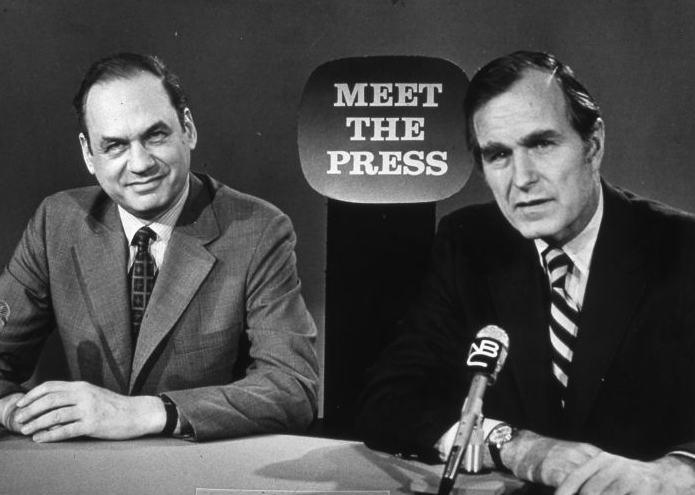 George Bush, Chairman of the RNC, speaks on NBC's MEET THE PRESS news program, 10 Jun 73. 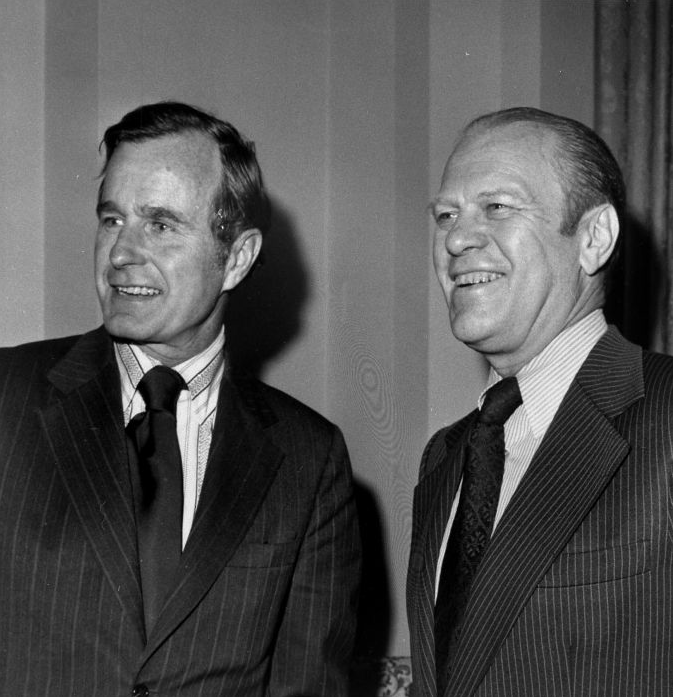 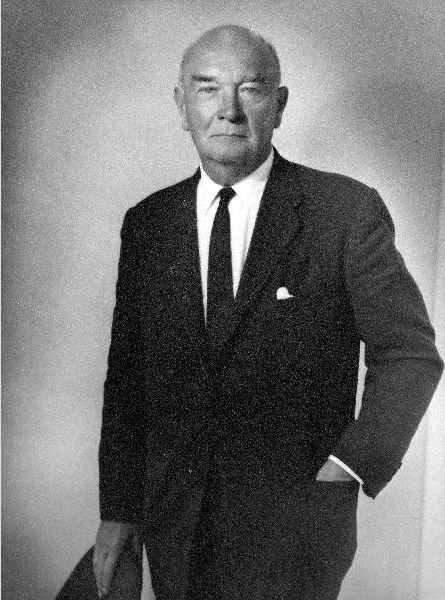 In late 1972, Ambassador Bush assumed the role of Chairman of the Republican National Committee. 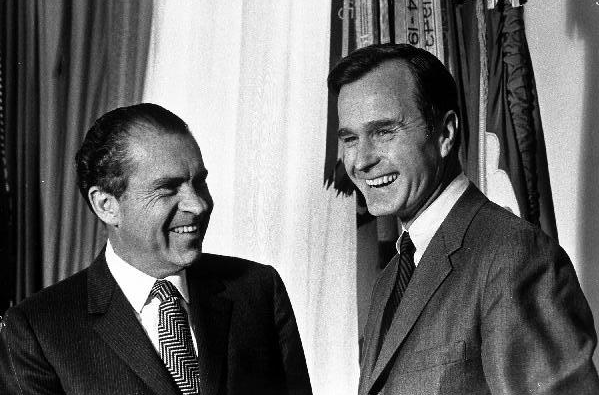 Throughout 1973, Bush worked hard to keep the stain of Watergate from tainting the Republican Party. 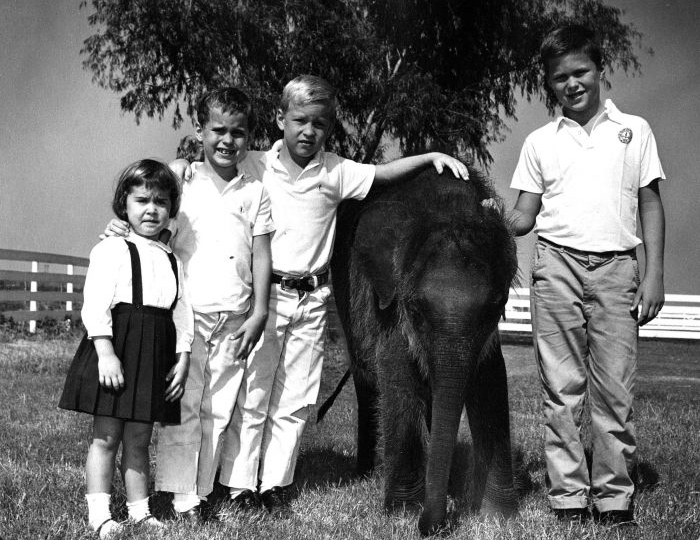 On exhibit here is a whimsical and elegant display of elephants, the well-known symbol of the Republican Party, from the museum's collection of over twelve hundred. 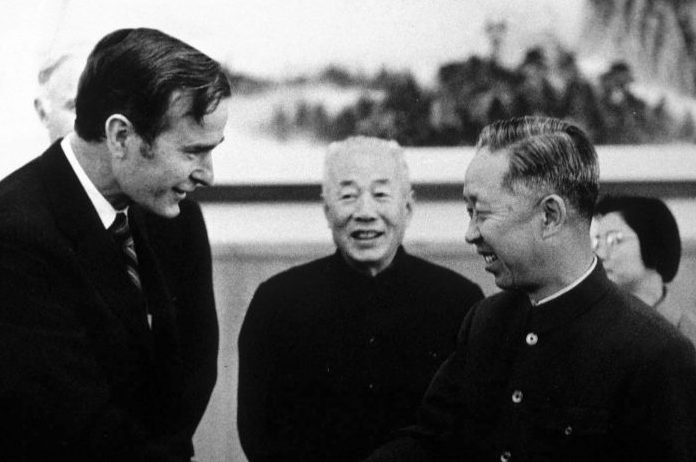 US Liaison to China, George Bush, speaks with Yu Zhan, Vice-Minister of the Chinese Ministry of Foreign Affairs, and Wang Yeqiu, Director of the Bureau of Historical Relic Administration. 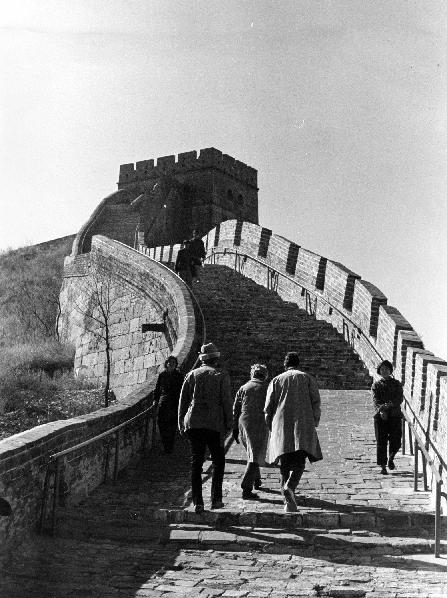 In the background is their translator, Tang Wensheng, 1975. 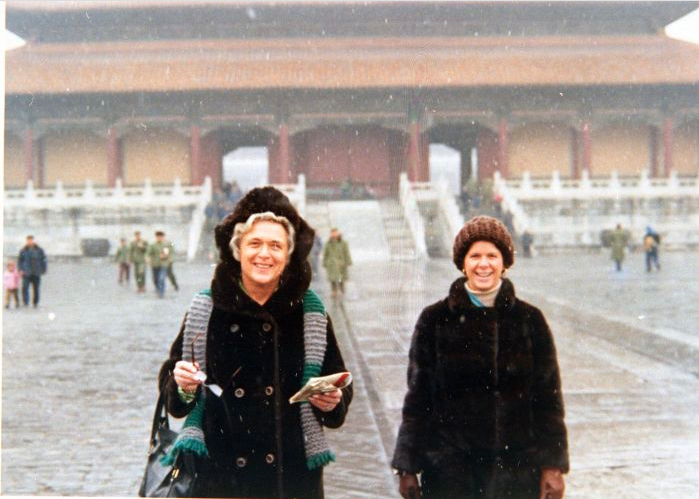 Experience China through the camera lens of Barbara Bush. 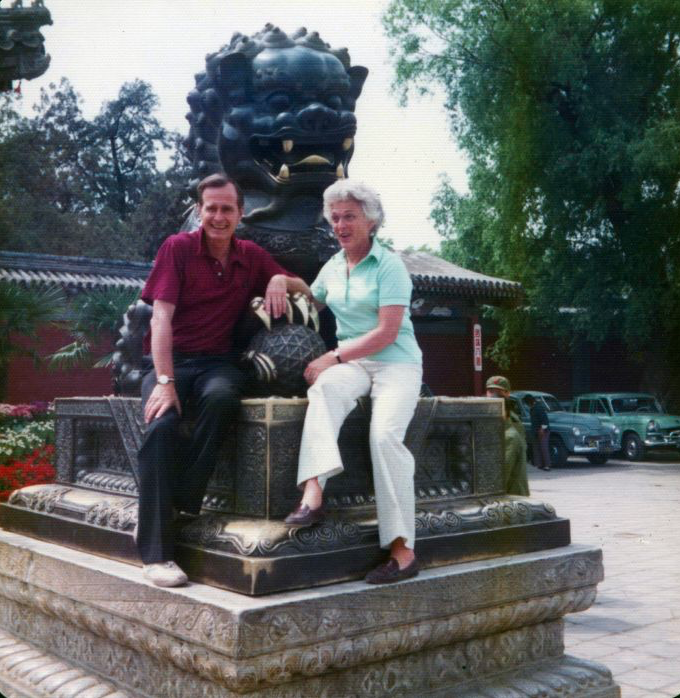 A large mural of a picture she took while George was serving as Chief of the U.S. Liaison Office spans the wall, while the large red and turquoise pagoda offers a glimpse of life in Peking (now known as Beijing) for George and Barbara Bush. 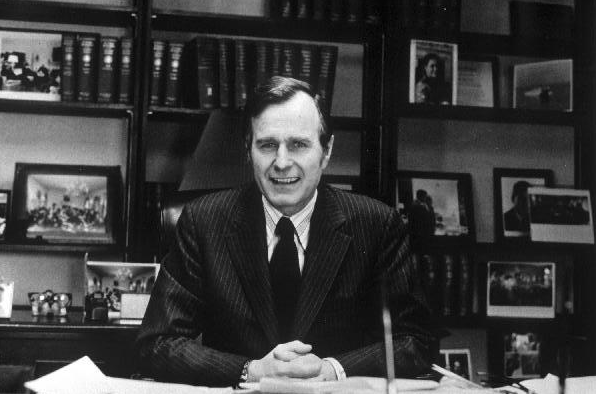 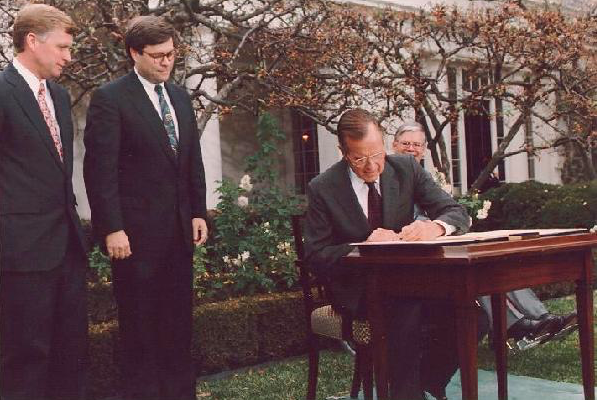 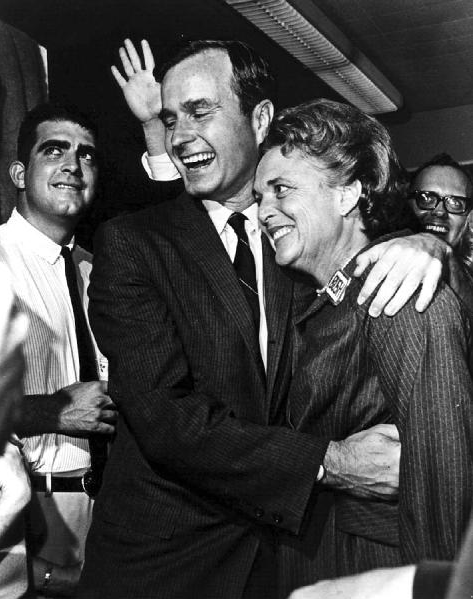 There before the United States had established normal diplomatic relations with the People's Republic of China, the Bushes jumped right in as George essentially served as the Ambassador in Peking. 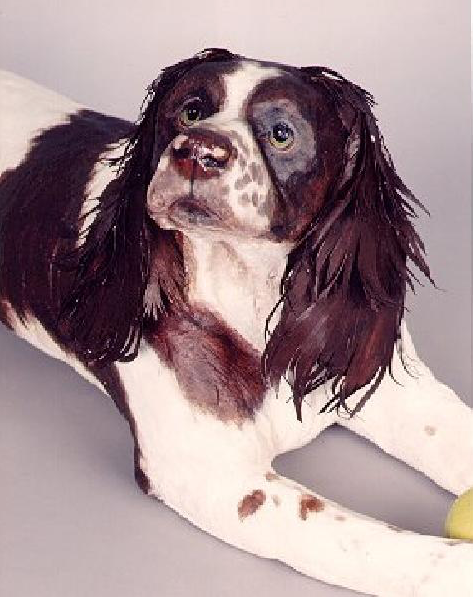 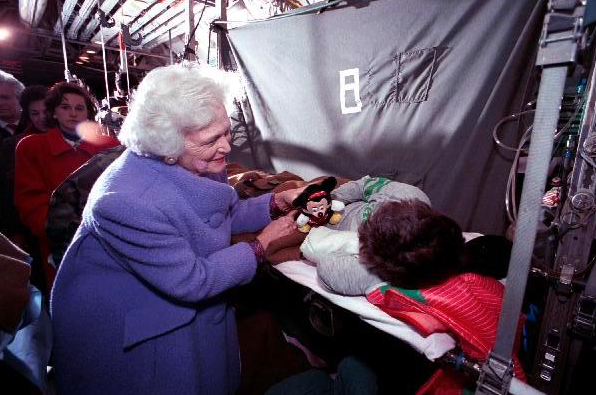 The video slideshow comes from Barbara Bush's personal collection. 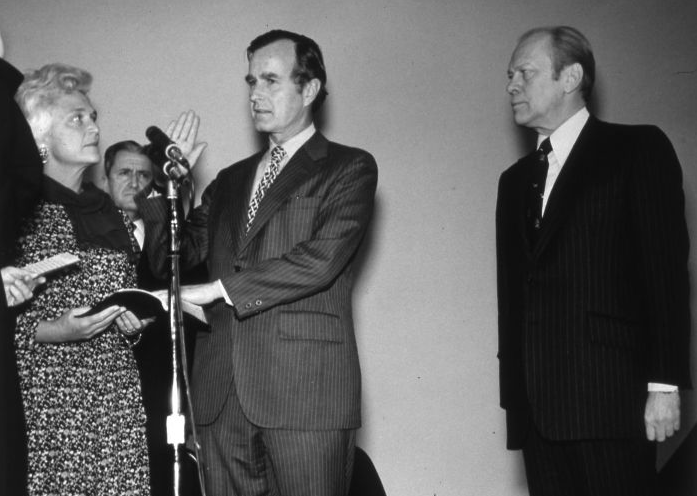 George Bush takes the Oath of Office as Director of the Central Intelligence Agency from Supreme Court Justice Potter Stewart as his wife, Barbara, holds the Bible and President Gerald Ford witnesses the ceremony at Langley, VA, January 1976. 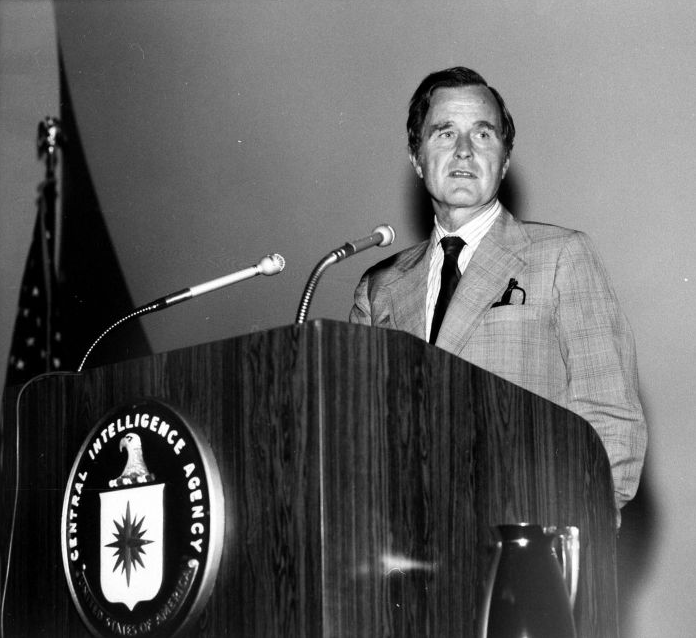 In 1976, during the Ford Administration, George Bush became the Director of the Central Intelligence Agency (CIA). 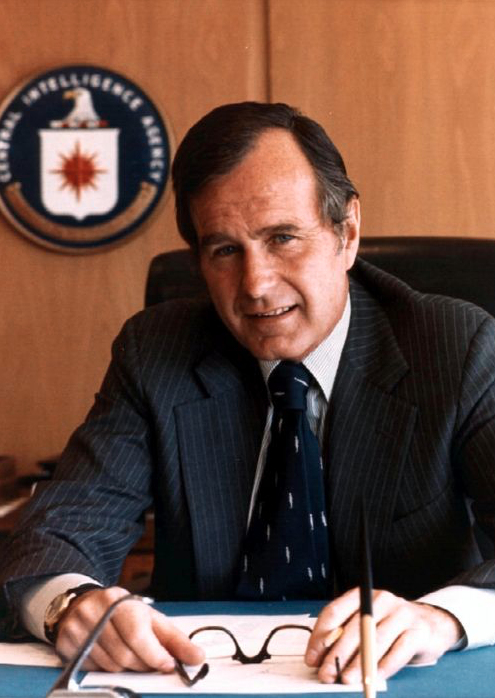 Bush took on the tremendous task of improving the image of the Agency and curbing Agency excesses, while still being able to provide the President's office with essential intelligence data. 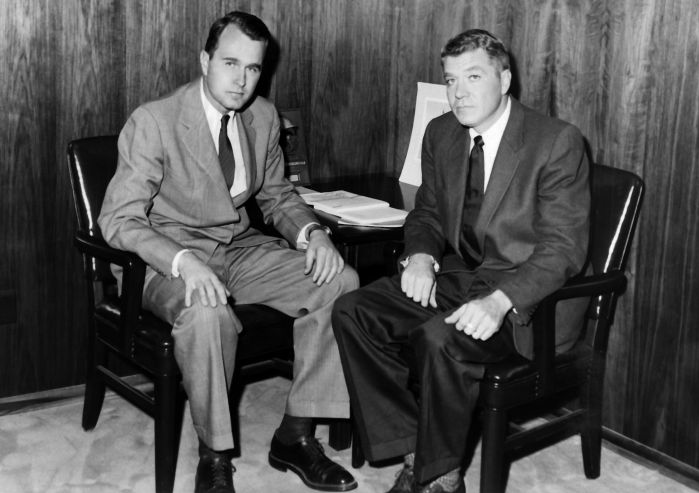 The decisions he made during this time helped restore the image of the CIA and maintain the essential balance of power during the Cold War. 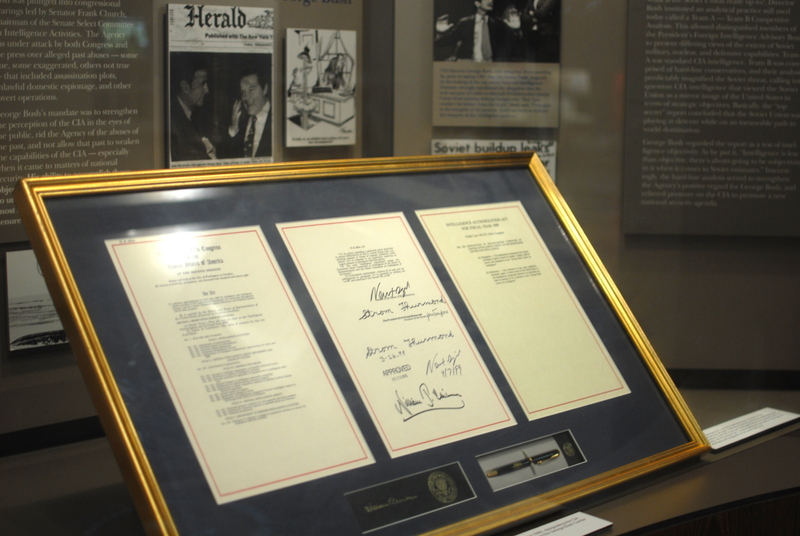 Open the drawers to see spy equipment used by agents during this time. 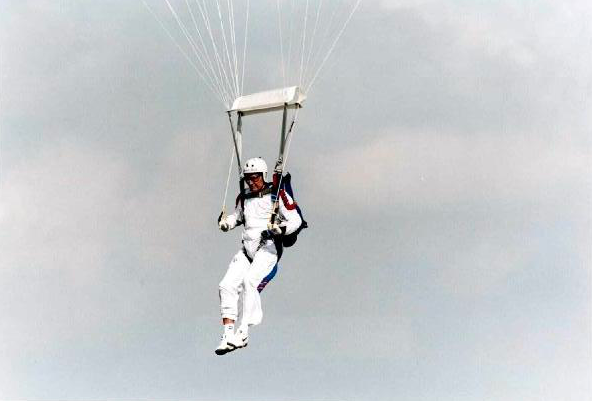 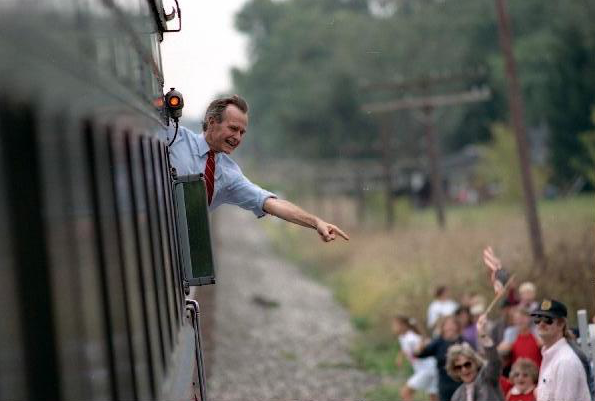 As Vice President, George Bush traveled an estimated 1.3 million miles, a distance equal to about fifty-four trips around the world! 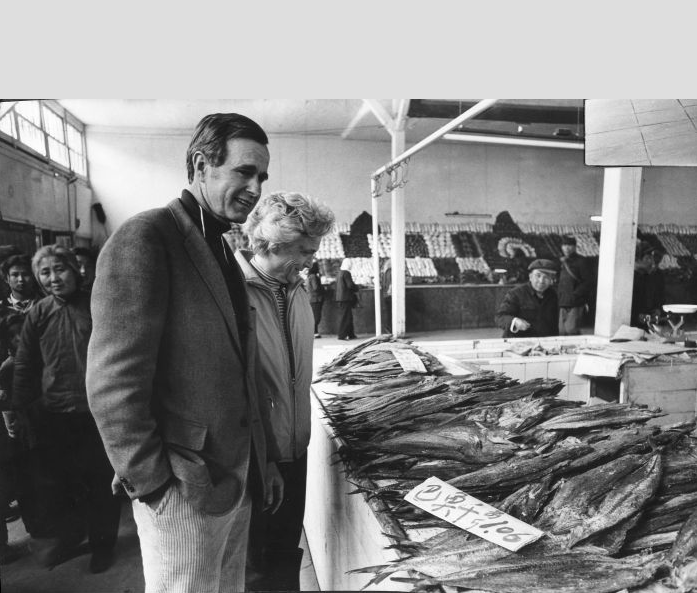 An interactive map details this impressive amount of travel, and interactive programs allow you the opportunity to view hundreds of documents from the Library's Archives regarding some of these important trips. 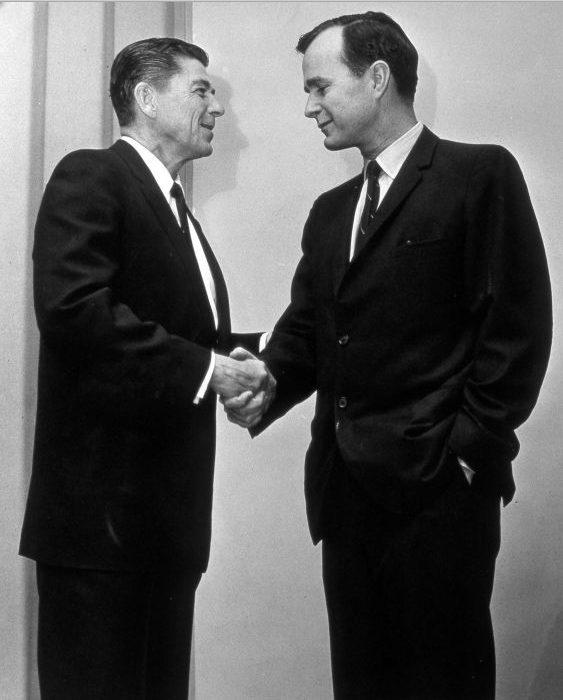 Also included are many articles and pictures which record this important stepping stone for the soon-to-be President. 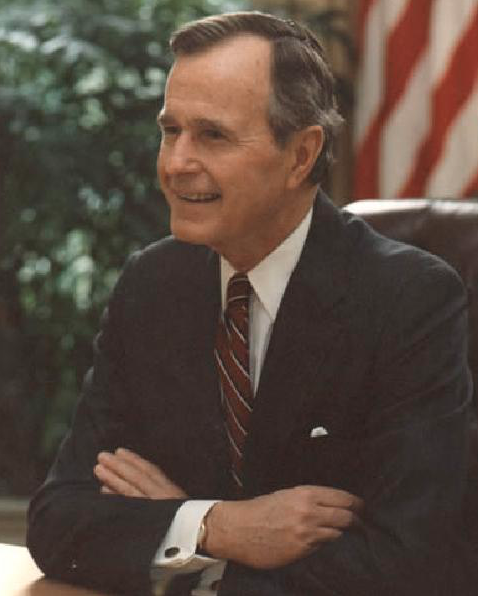 George Bush is elected the 41st President of the United States on Nov. 8, 1988. 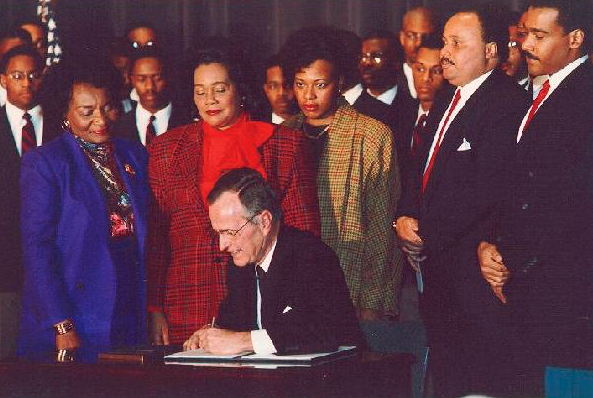 Bush won 53.1% of the popular vote and 426 electoral votes. 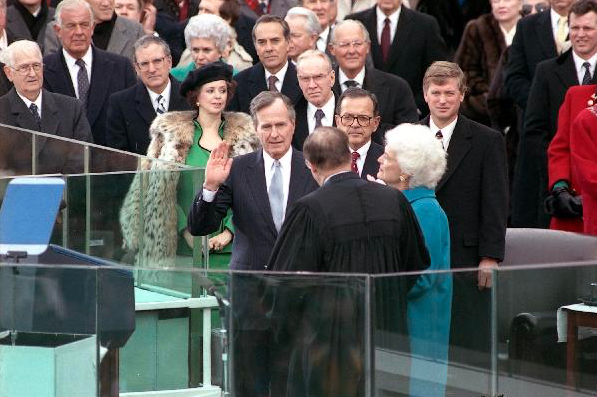 Read a copy of the Houston Chronicle from the day after the election, and see photos of President Bush’s inauguration Jan. 20, 1989. 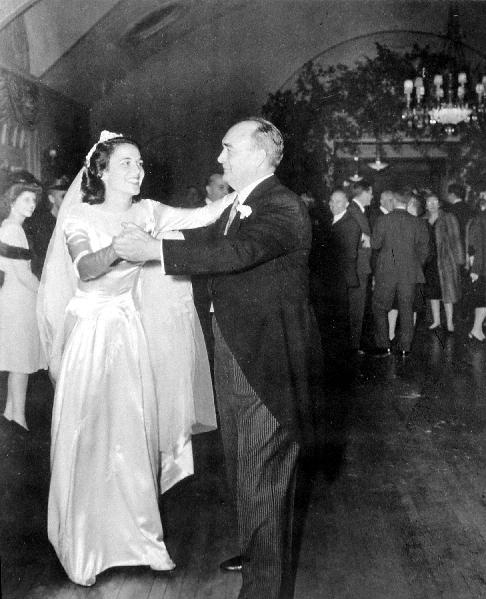 President and Mrs. Bush hosted many important events while they were at the White House, and some of the most sophisticated were State Dinners. 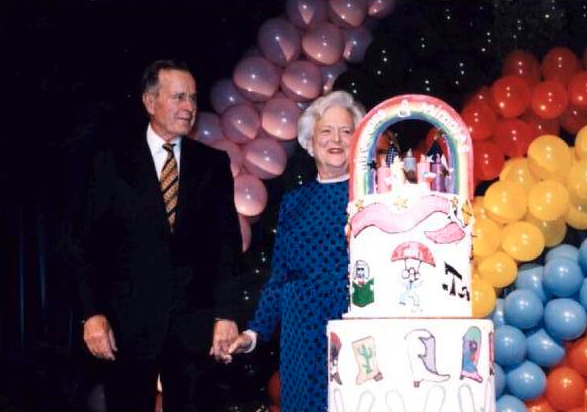 A bigger than life mural makes you feel as if you are standing in the dining room with the guests. 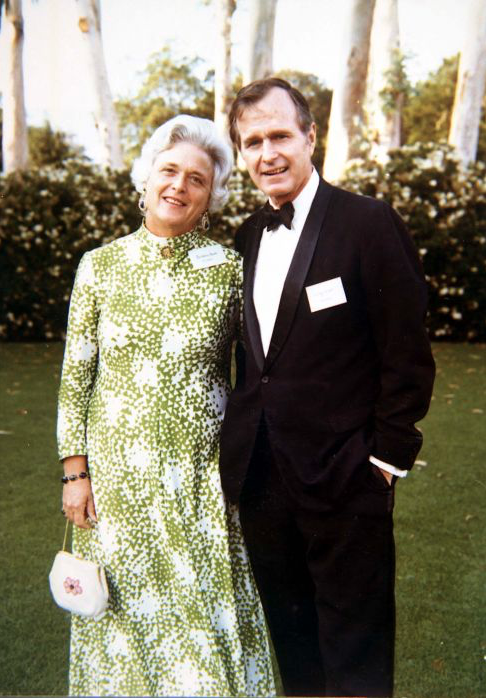 One of Mrs. Bush's elegant gowns and one of President Bush's distinguished tuxedos are on display. 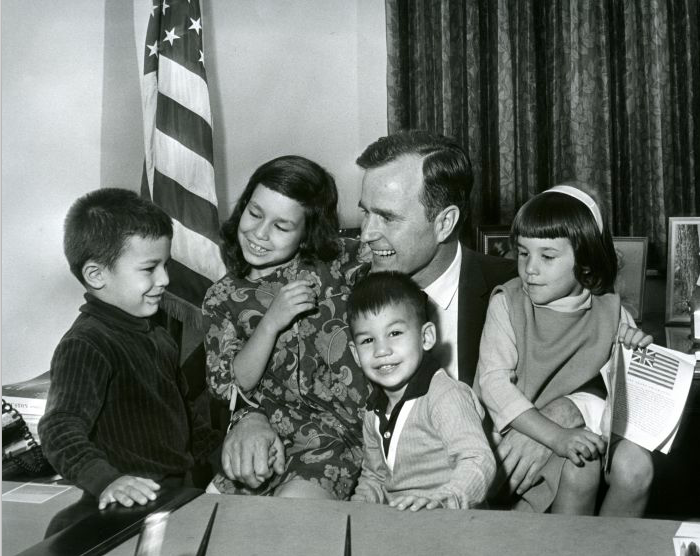 Have you ever wondered what it would be like to give a press conference at the White House? 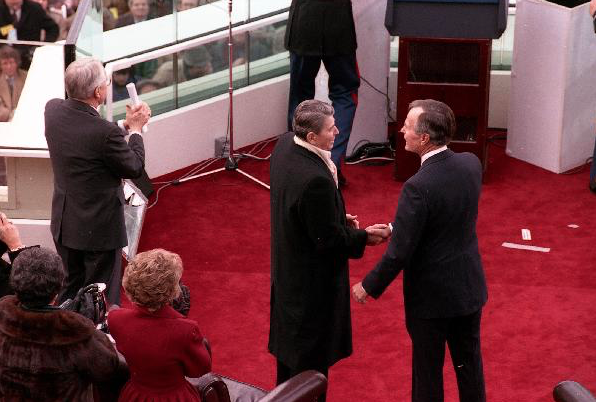 Here you can step into the role of the President and read a speech from the teleprompter. 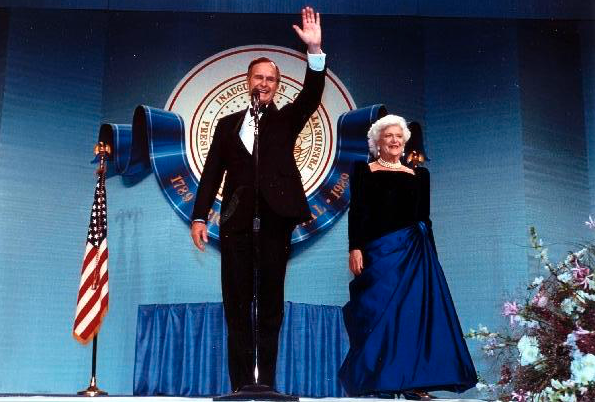 Also, watch a video of President Bush's inauguration, and learn about Vice President Quayle's contributions to the Administration. 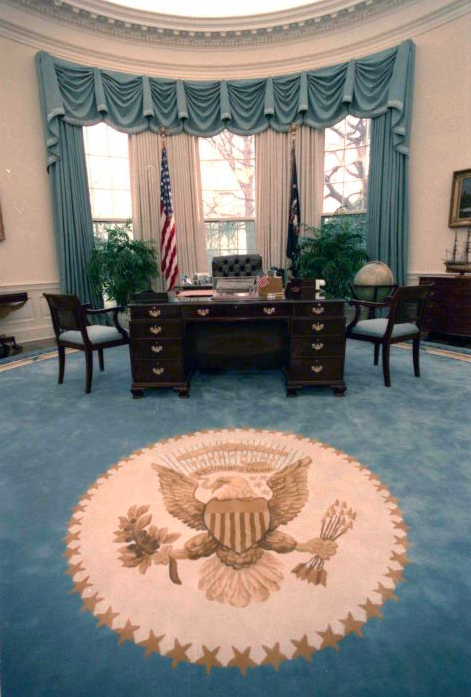 For the first time ever at a Presidential Library, you can sit behind the most powerful desk in the world. 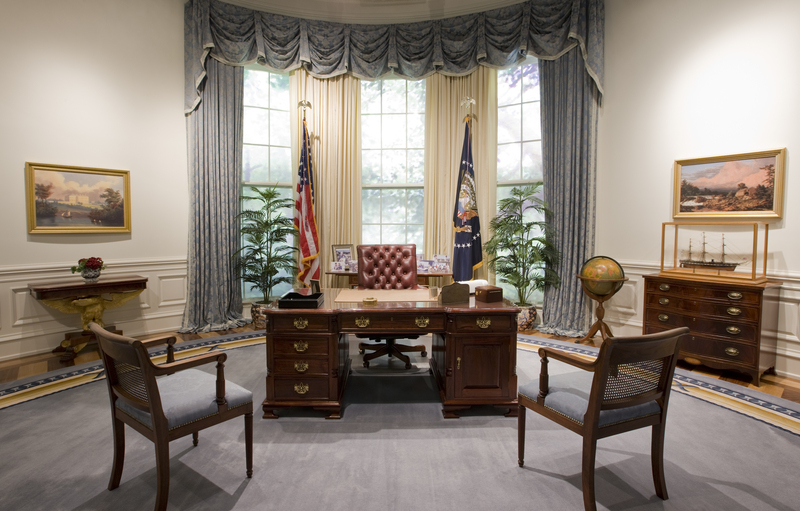 The Oval Office exhibit features a replica of the President's desk, decorated just as President Bush had it while he was in office. 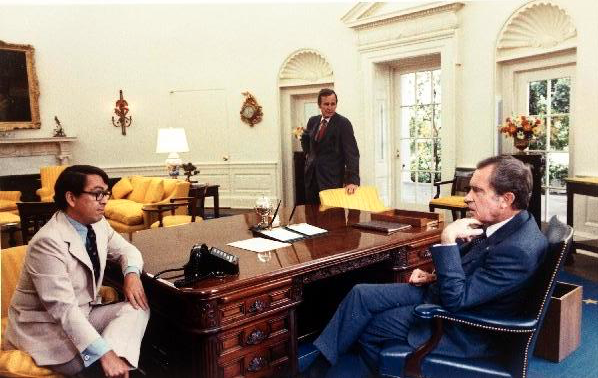 Don't forget to have the docent take your photo as you sit in the seat of power. 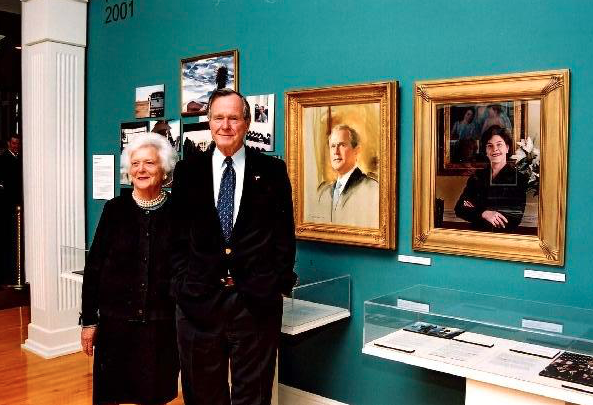 The perfect backdrop for this section on President Bush's domestic policy is the large scale mural that features photos from various programs and initiatives. 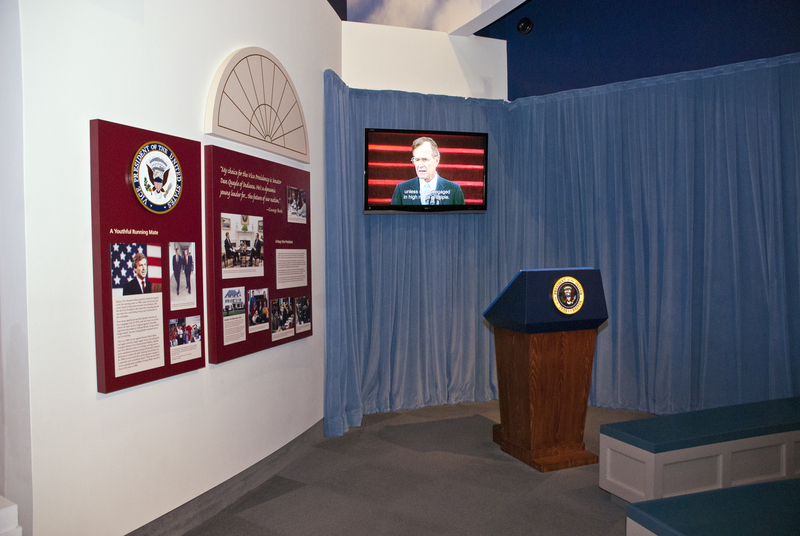 Sit at an interactive kiosk and learn about the Bush Administration's domestic policy, which included the Americans with Disabilities and Clear Air Acts. 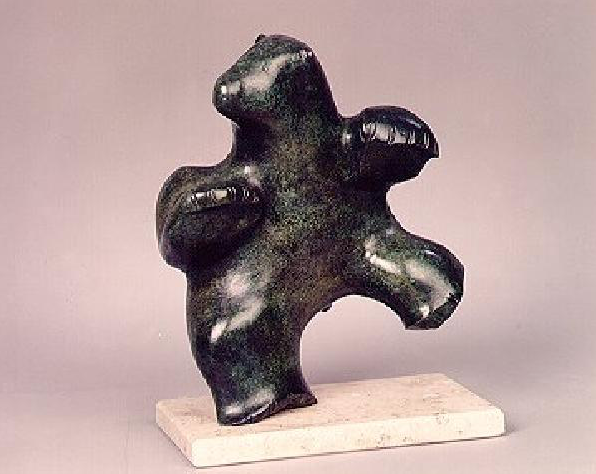 Sculpture, "Dancing Bear" Artist: Pauta Saila Medium: Bronze Date: July 17, 1990 Gift of the Right Honorable and Mrs. Brian Mulroney, Prime Minister of Canada. 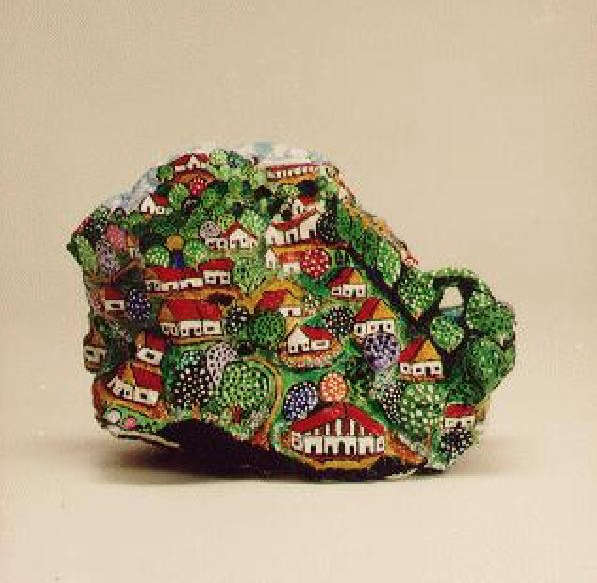 Foreign Heads of State often give exquisite works of art and craftsmanship that reflect their nation's artistry, geography, industry, technology, religion and history. 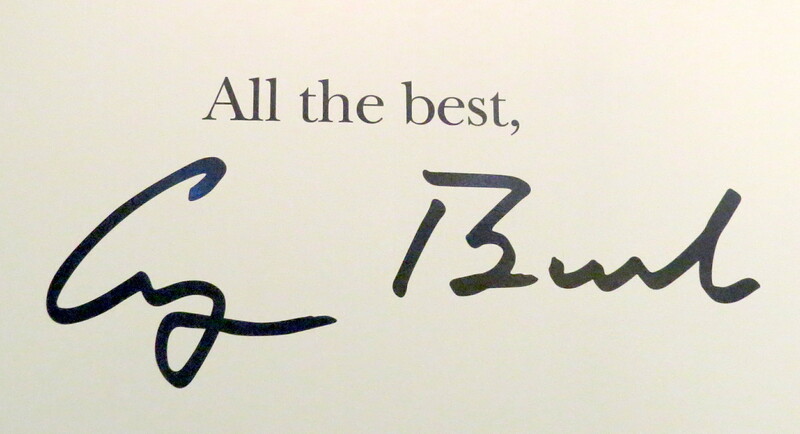 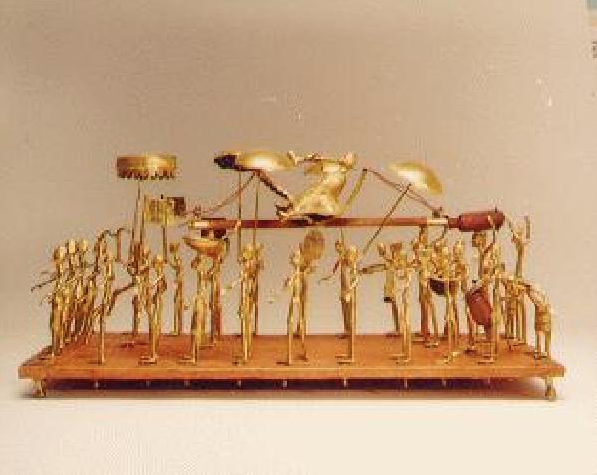 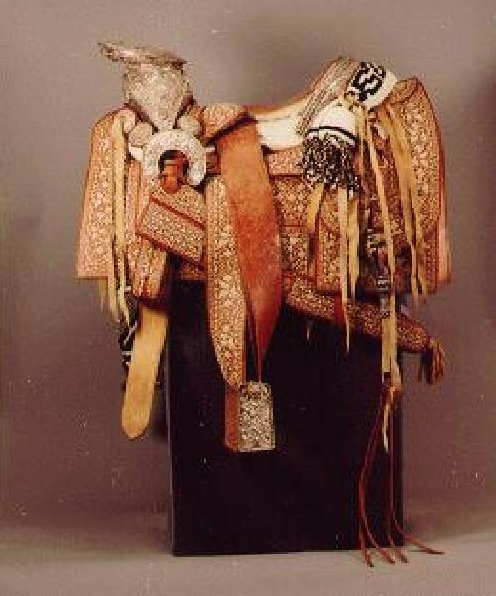 On display is just a sample of the countless gifts received by President Bush while in Office. 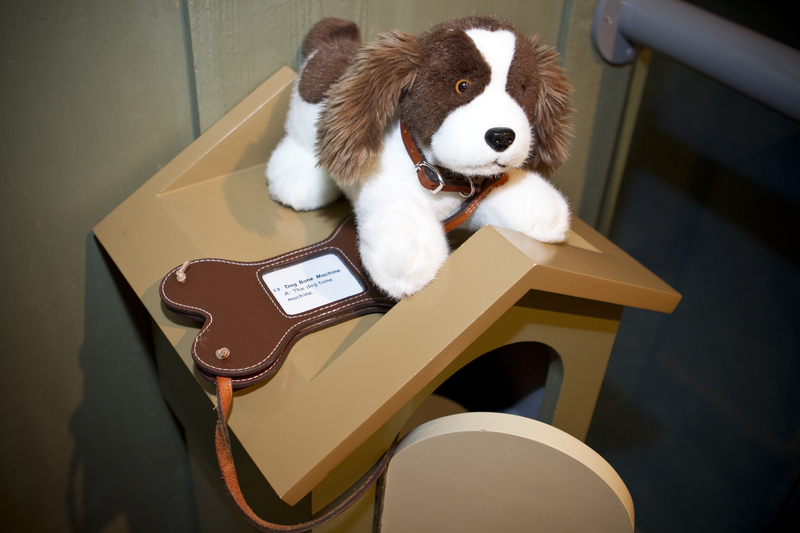 You can also explore more gifts, and the countries from which they were given, at the interactive kiosk. 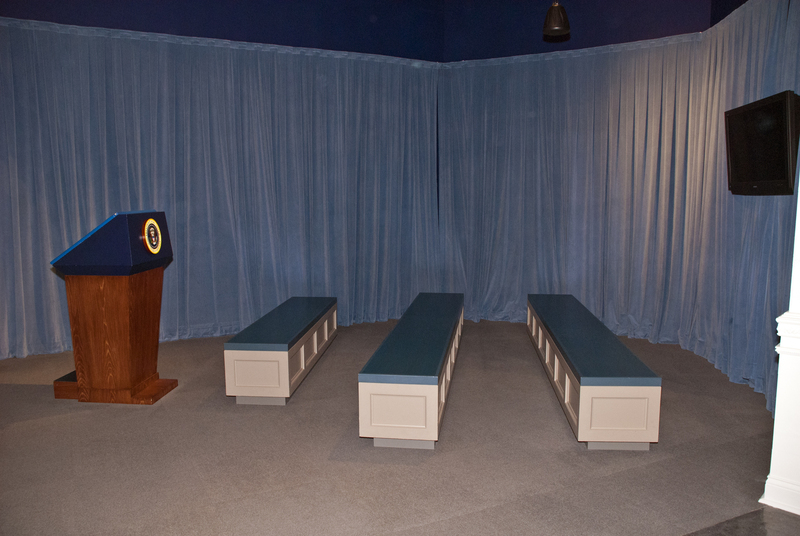 This special area of the museum is dedicated to the First Lady. 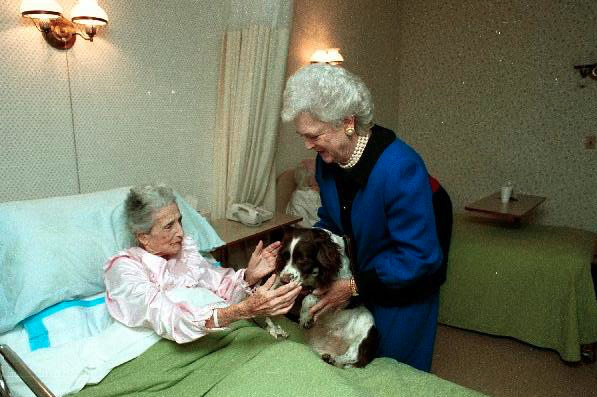 You can take a look at Barbara Bush's busy schedule and watch a film on Mrs. Bush. 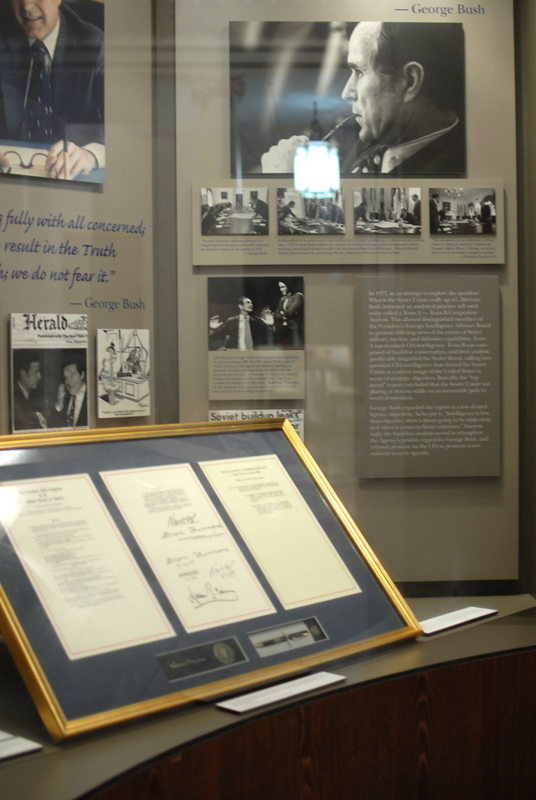 The exhibit also contains many artifacts representing her exemplary service during her time as First Lady. 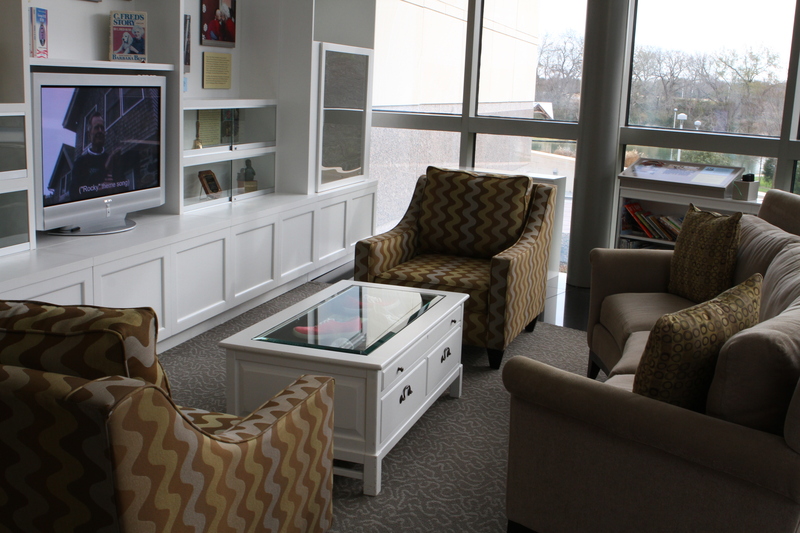 The Overlook is the perfect place to settle into a comfortable chair or couch while you read one of the many books available to your kids or grandkids. 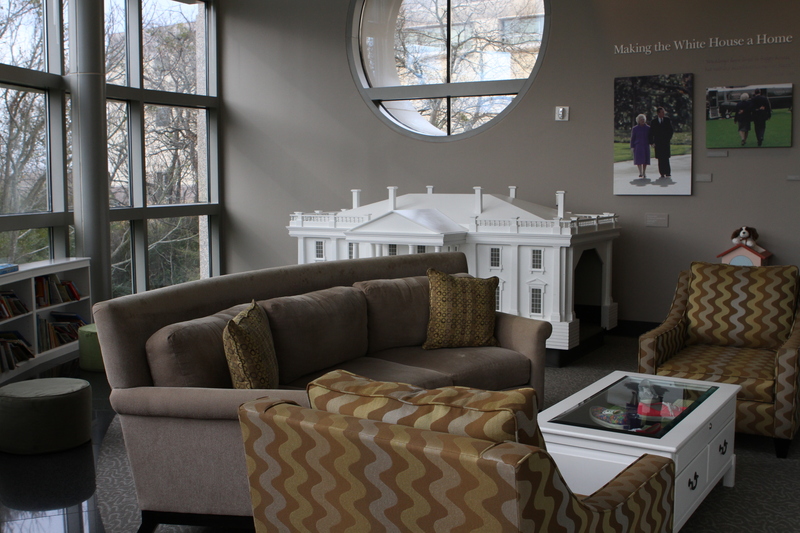 The kids can crawl inside the White House model and hear Mrs. Bush read one of four different stories. 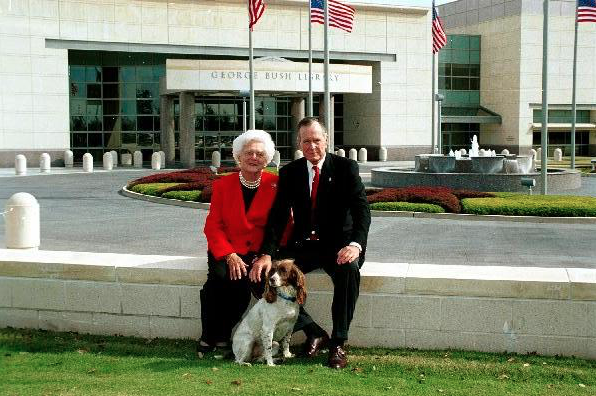 Don't miss the opportunity to survey the grounds behind the Library, which includes a beautiful pond and the Barbara Bush Rose Garden, or watch the entertaining video we affectionately call "Bushes Unplugged." 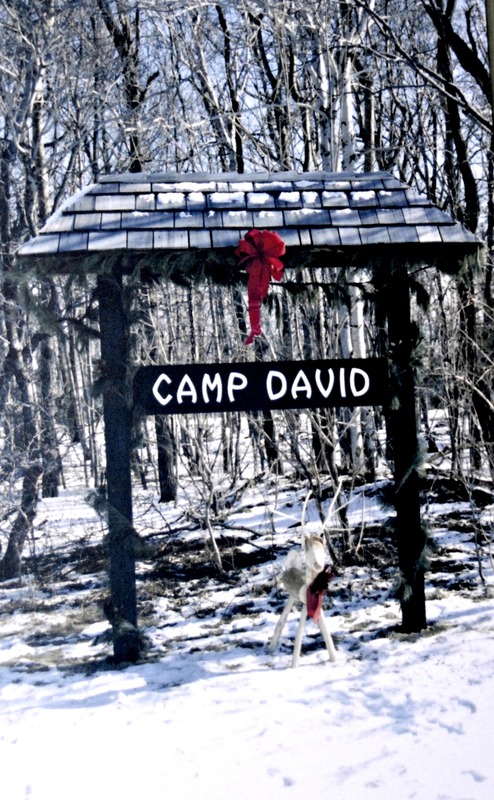 The Laurel Office at Camp David was the scene of many of President Bush's most important decisions. 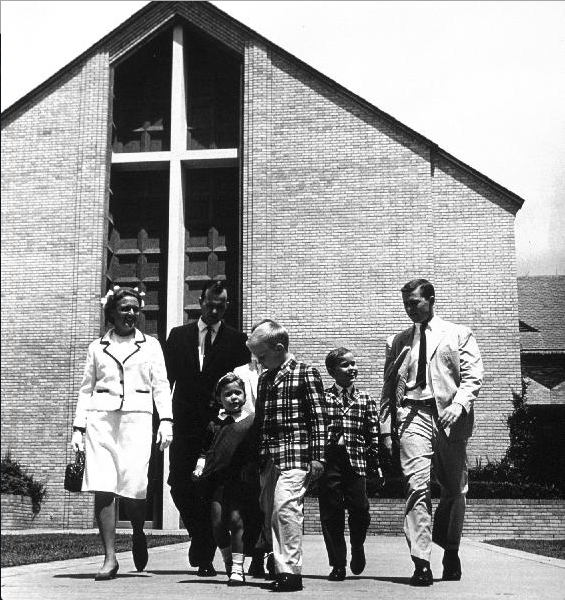 It was also home to many happy family memories, including Christmases and the marriage of his daughter, Doro. 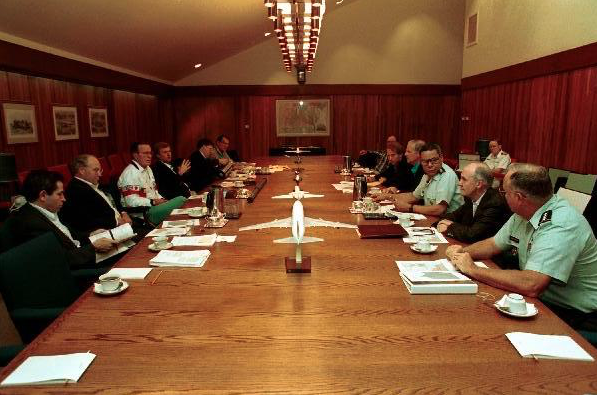 All of the artifacts in the Office come straight from Camp David. 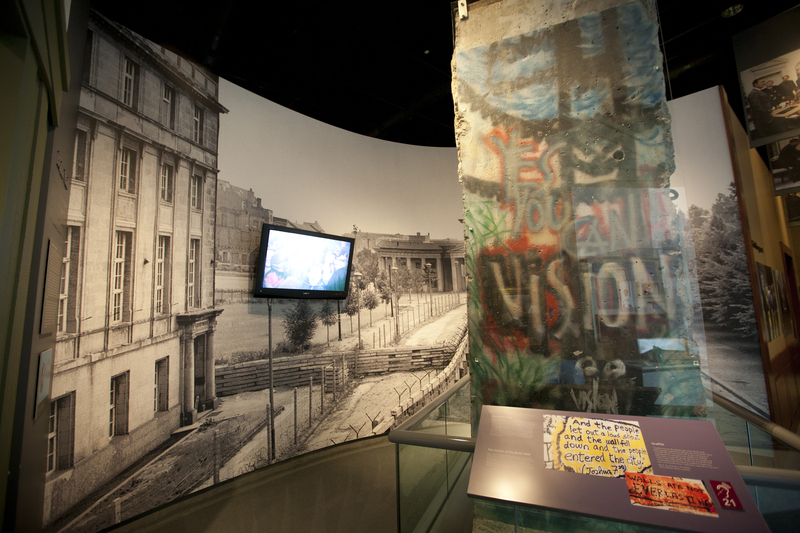 Perhaps one of the most recognizable symbols of the Cold War is the Berlin Wall. 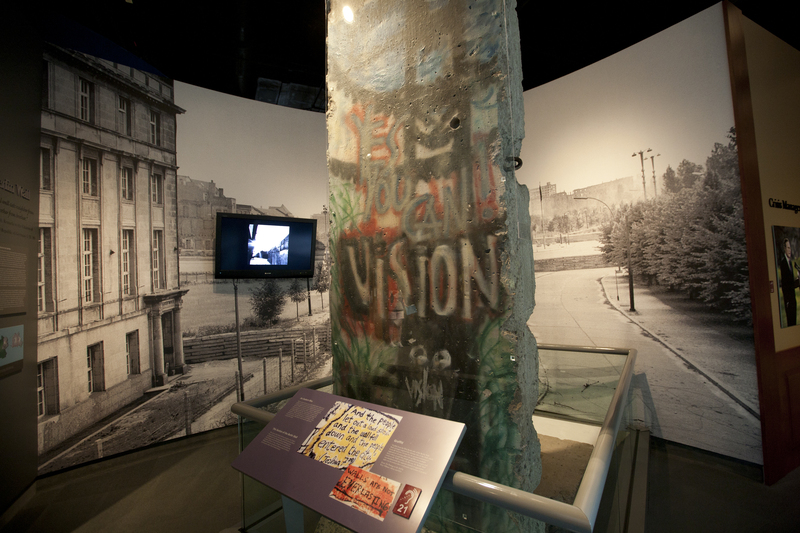 In this exhibit, view a 12-foot tall section that once symbolized oppression, communism and division. 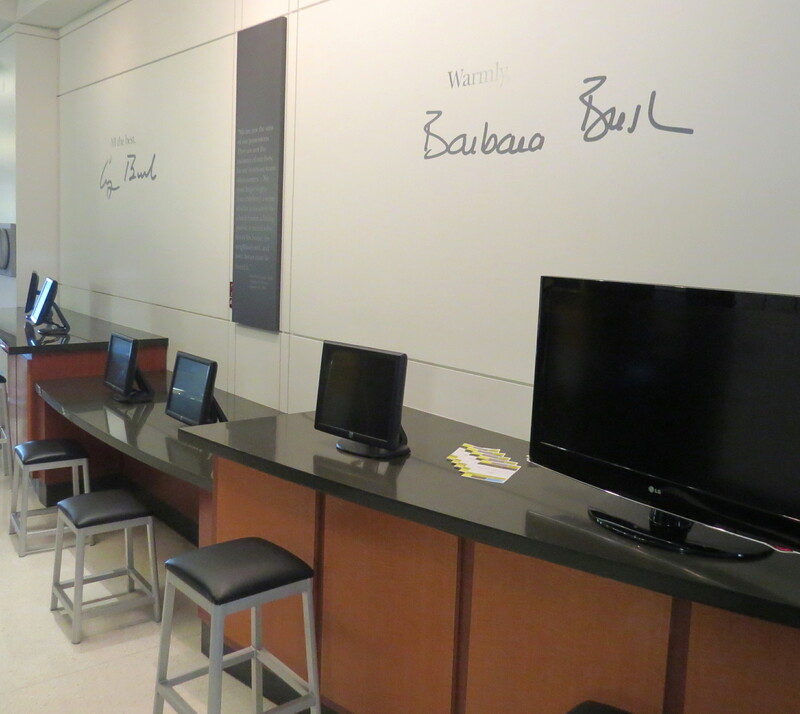 Video highlights at the kiosks detail the other important international events faced by the Bush Administration. 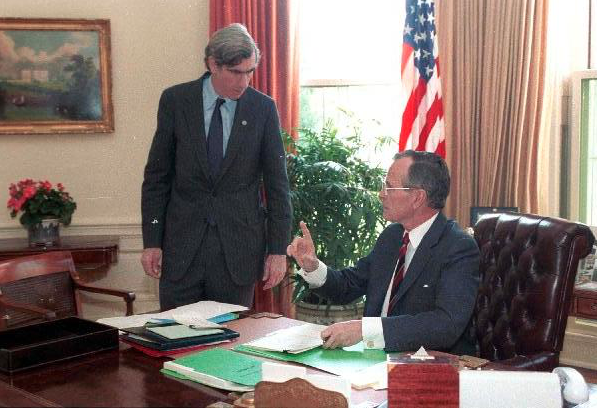 Have you ever wondered what it would be like to advise the President on important decisions? 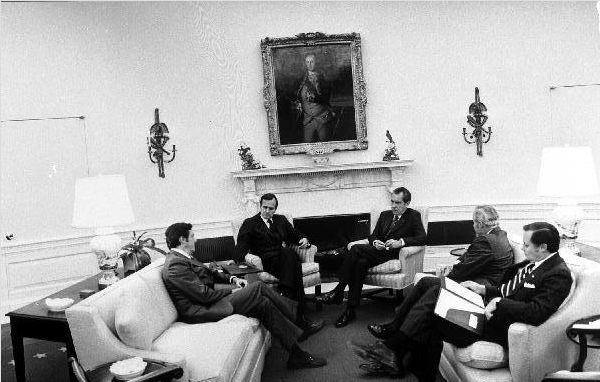 Here is your chance to experience the White House Situation Room, where the President is briefed by his advisors. 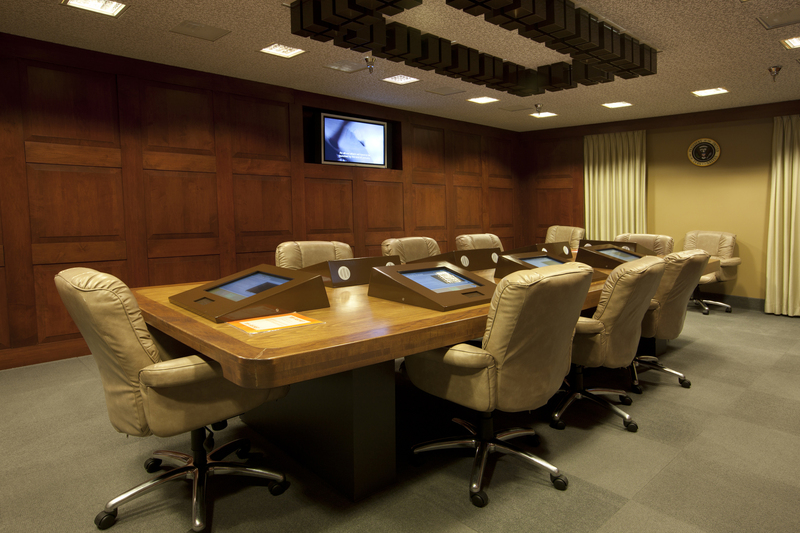 In the Situation Room, you can learn about the events and decisions that led up to the Persian Gulf War. 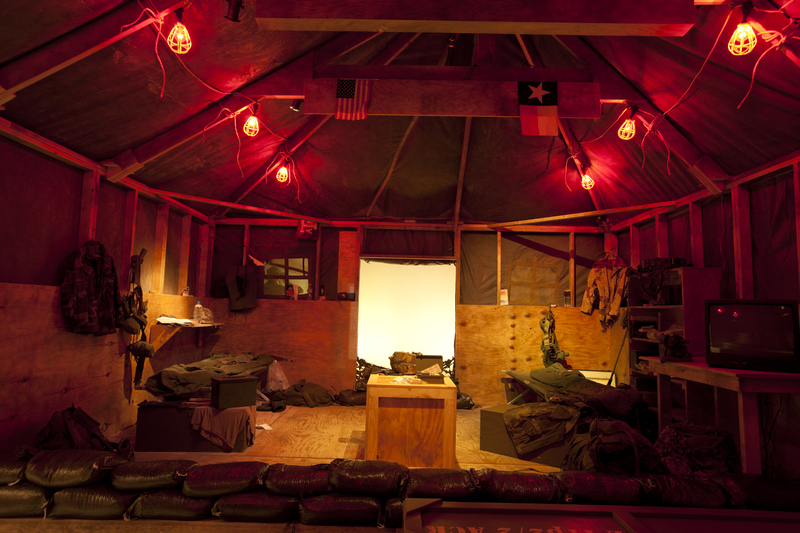 From the Situation Room, emerge into the Gulf War exhibit. 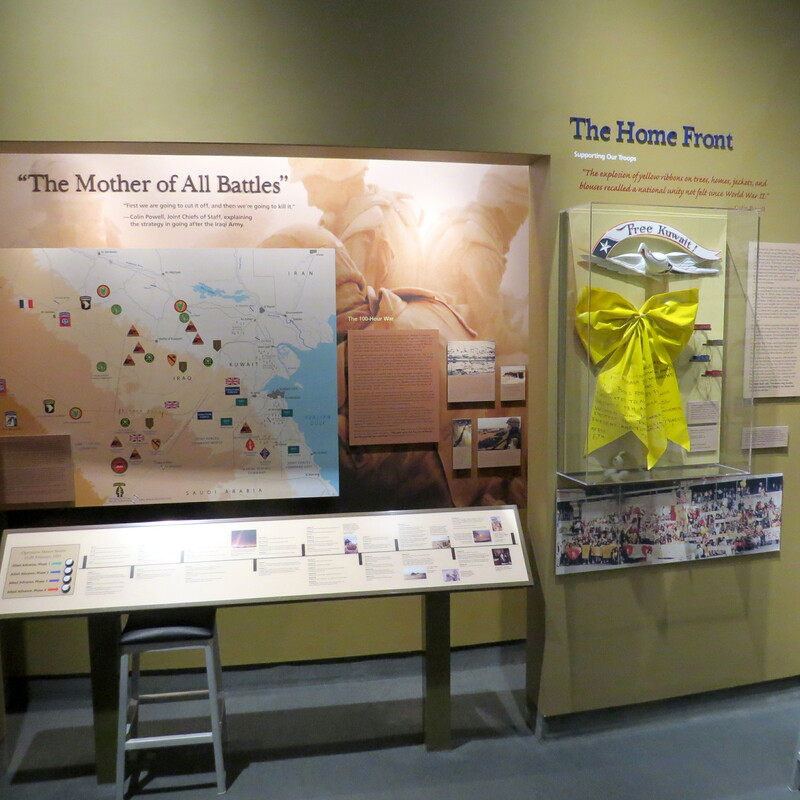 Interactive displays and fiber optic maps detail the events surrounding the battles in the Gulf. 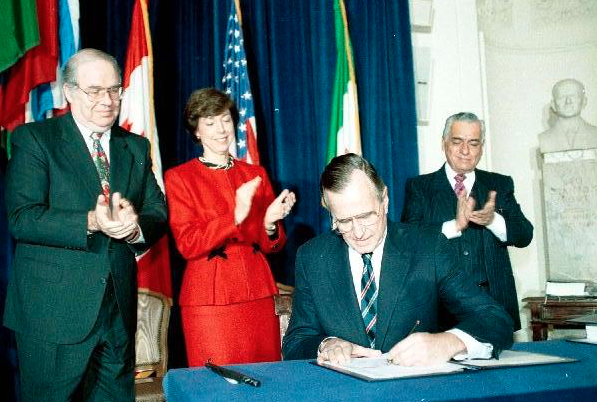 Learn how President Bush built a coalition of nations to turn back the aggression of Saddam Hussein and Iraq and to liberate Kuwait. 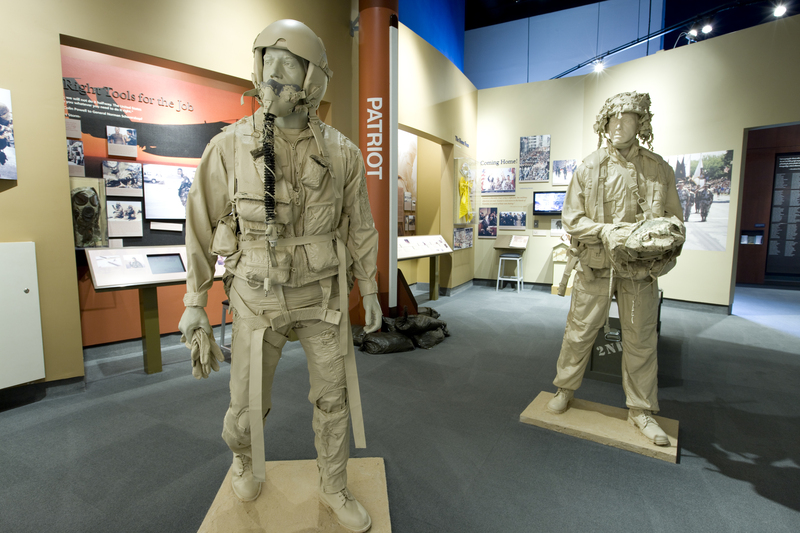 This section of the museum details the ecological damage in Kuwait caused by the retreating Iraqi army. 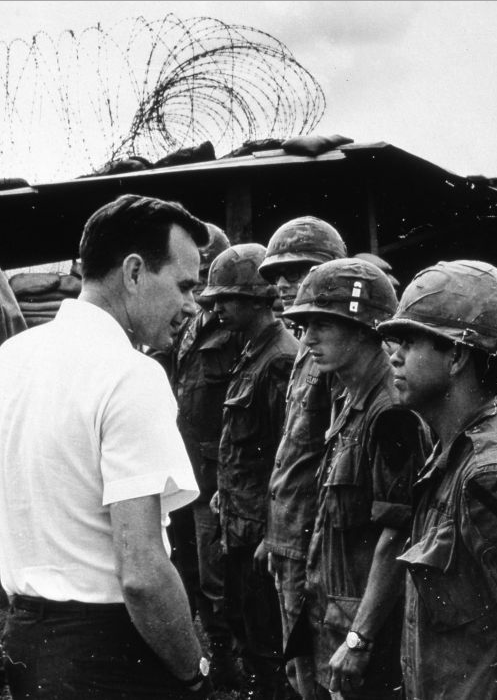 As the magnitude of the devastation was revealed, experts speculated it could take three years to get the fires under control. 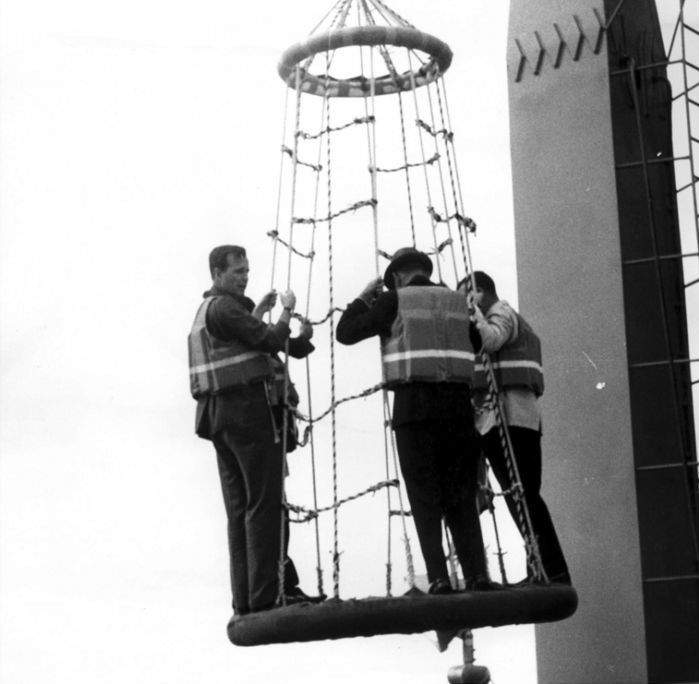 But miraculously, the myriad of firefighting teams put the fires out in just eight months, the last of which was ceremoniously extinguished on November 6, 1991. 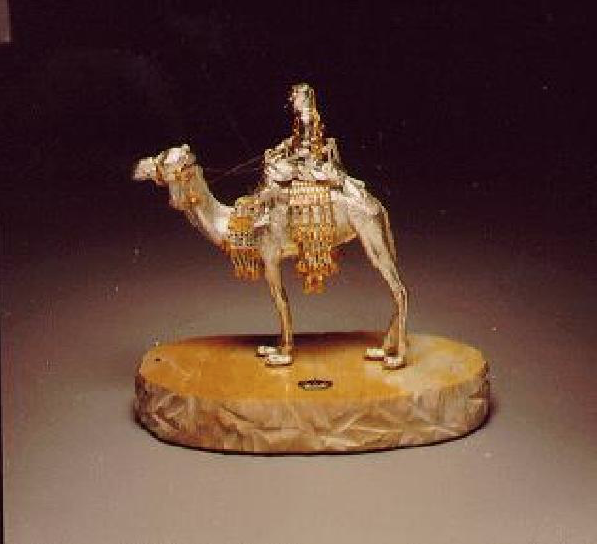 According to Kuwaiti custom, when a man gives you the key to his home, he is your friend for life. 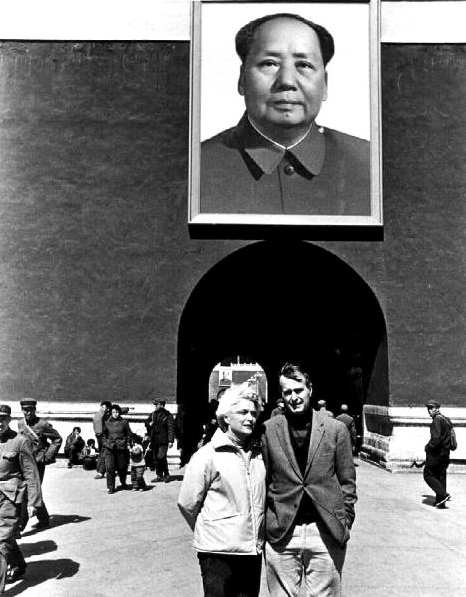 When a man gives you the door of his home you are a member of his family. 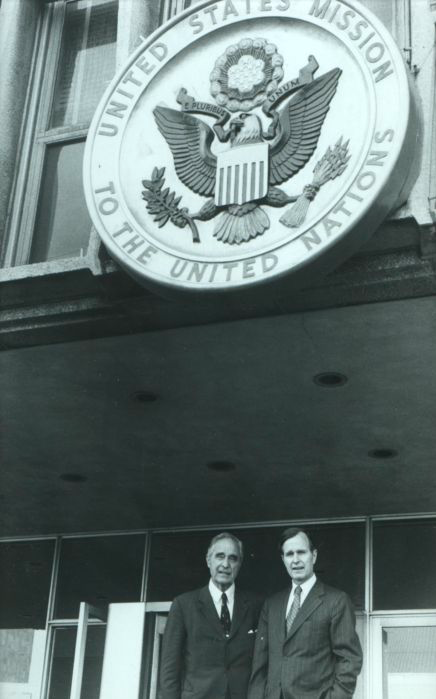 A sign of appreciation, this door was a gift from the people of Kuwait to President Bush. 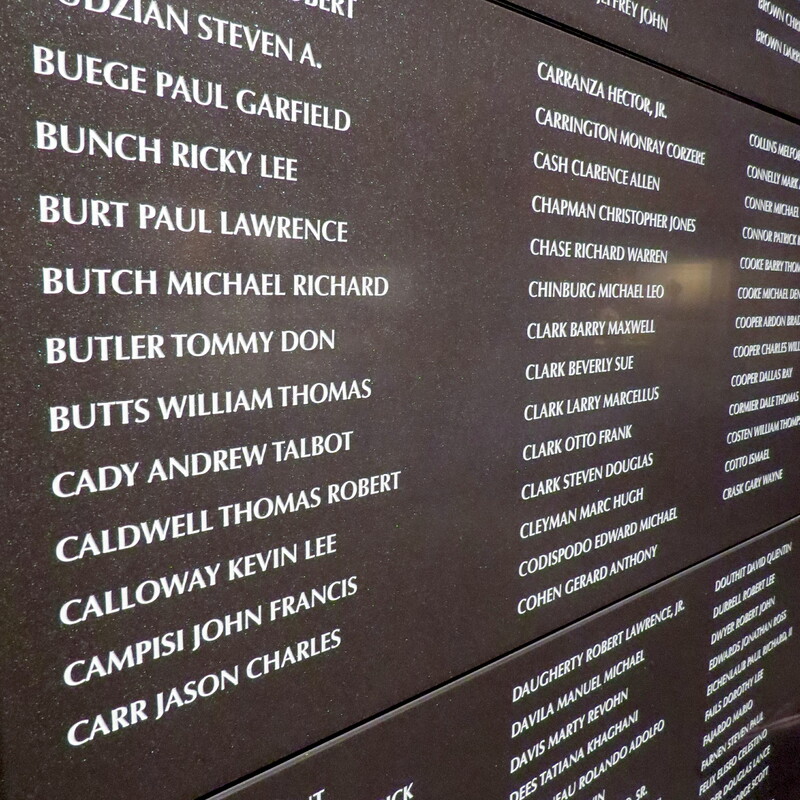 Also in this section, you can make a rubbing from the engravings of the names of servicemen and women who died restoring freedom to Kuwait. 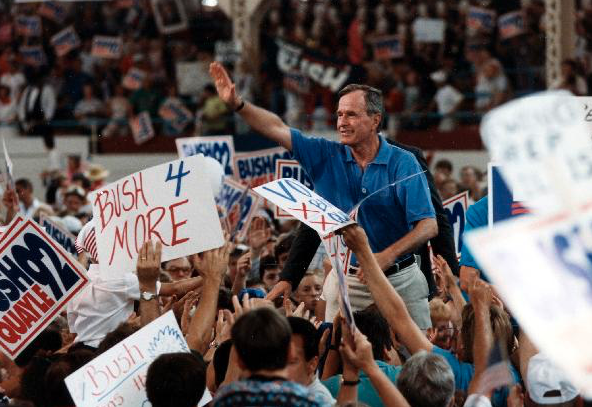 The hard fought, but ultimately disappointing campaign of 1992, when President Bush ran for re-election against Bill Clinton, is documented here. 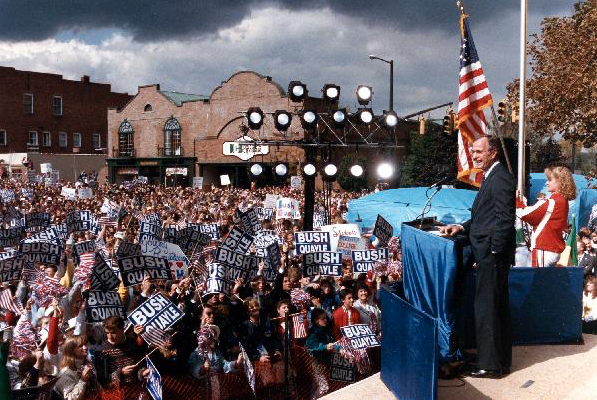 Despite President Bush's late surge in the polls, the popularity of the Independent candidate, Ross Perot, siphoned too many votes away in this tight campaign, leading to then Governor Clinton's victory. 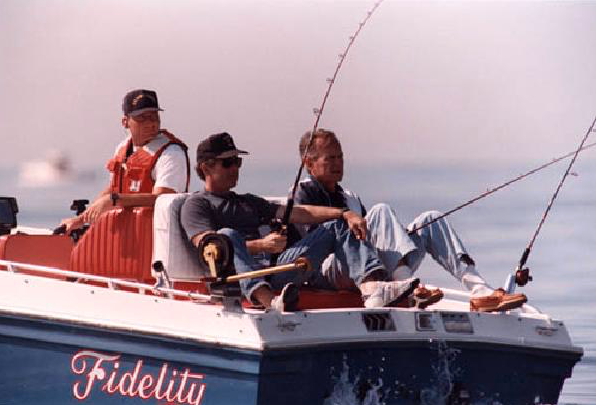 One of President Bush's favorite things is getting out on the water in his speedboat. 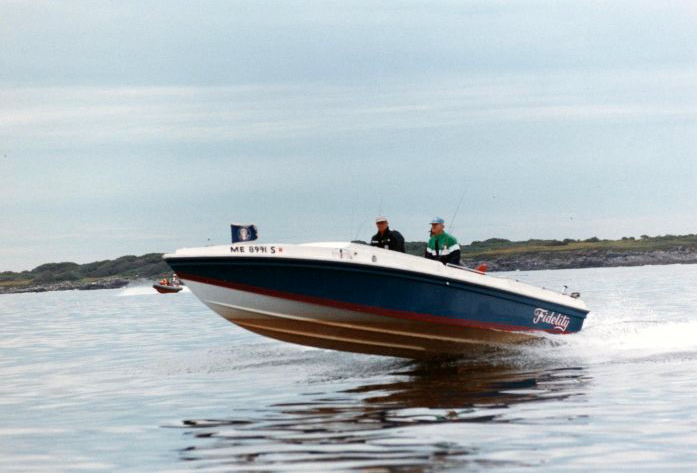 Here we have his actual boat, Fidelity, which he loved racing on the Atlantic waters off Kennebunkport until the boat's retirement in May 1998. 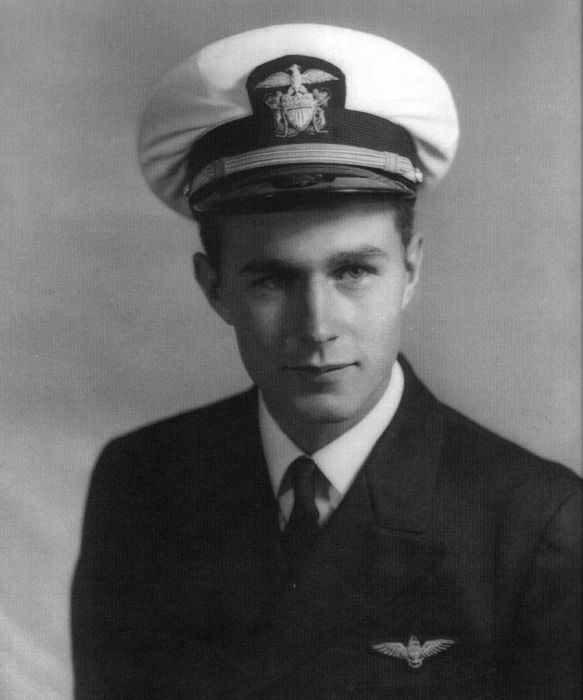 Life after the White House has not been boring for the Bushes. 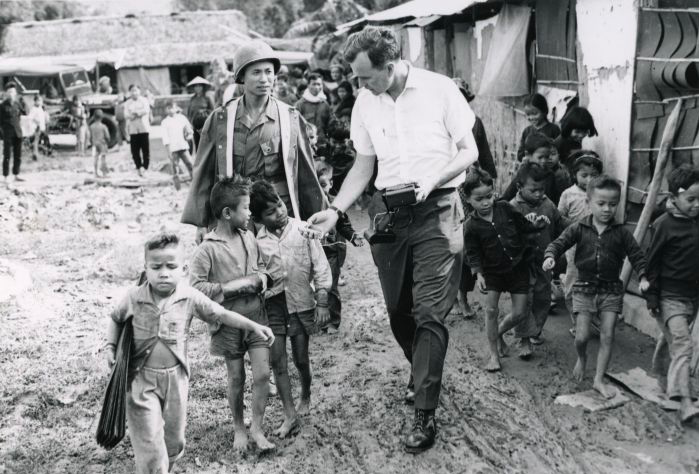 They remain active in many volunteer and humanitarian activities. 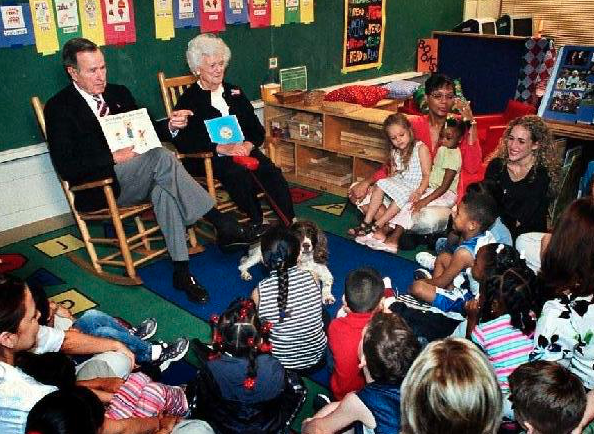 President Bush has written two bestsellers and completed three parachute jumps, and Mrs. Bush has continued her quest for national literacy and written two bestselling books. 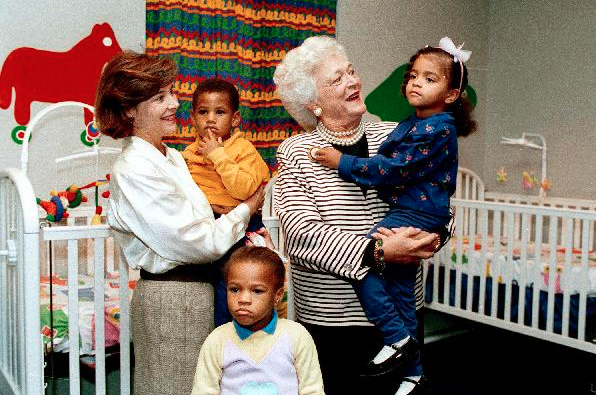 The Points of Light Foundation is an organization devoted to encouraging volunteerism within our communities. 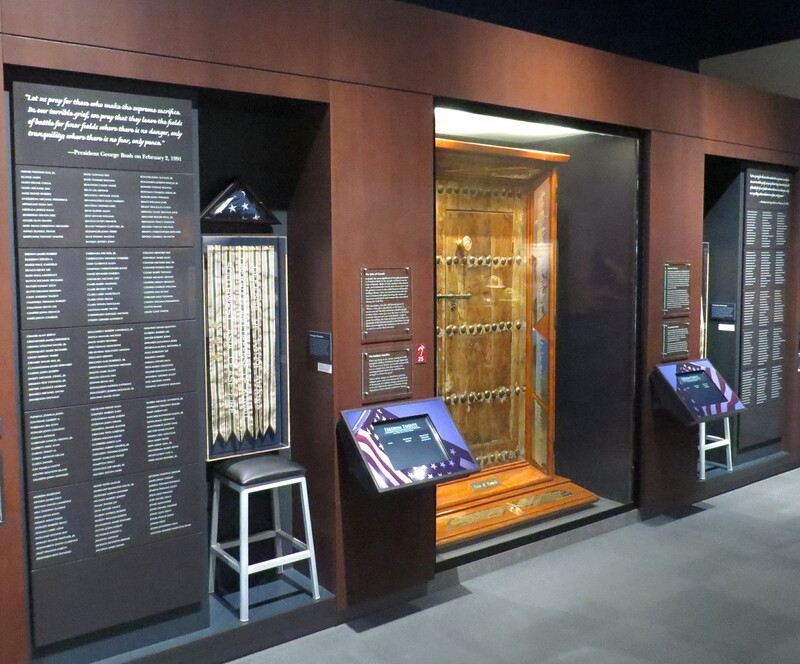 This part of the exhibit features a fiber-optic map of the United States, whose lights represent the points of light across America, and an interactive database that allows you to search and view profiles of the 4000 named Points of Light, including those chosen during the Bush Administration. 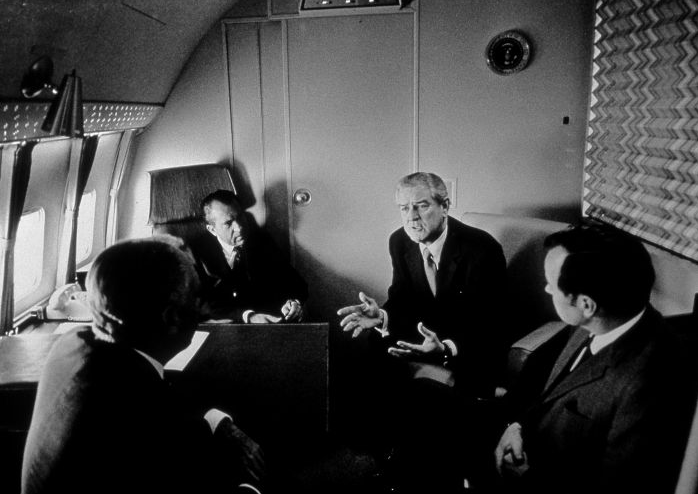 Have you ever wanted to ask the President a question? 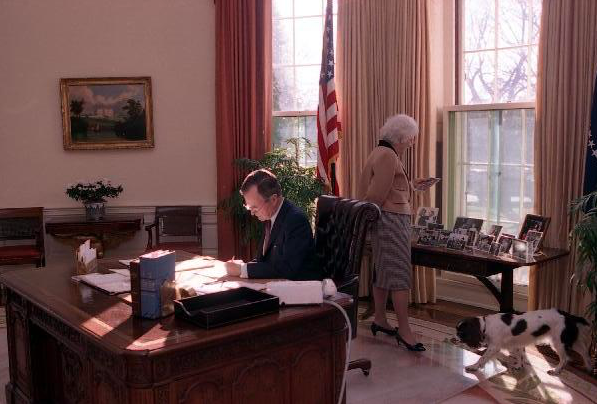 These interactive computers allow you to select from a series of questions and receive a personalized letter from either President or Mrs. Bush. 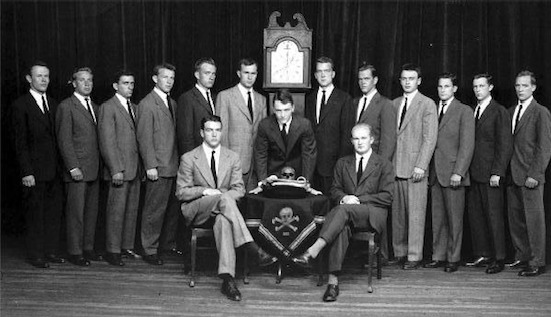 Also, learn how you can become a point of light in your own community by doing the things that are of interest to you.